Video not supported, please upgrade your browser. 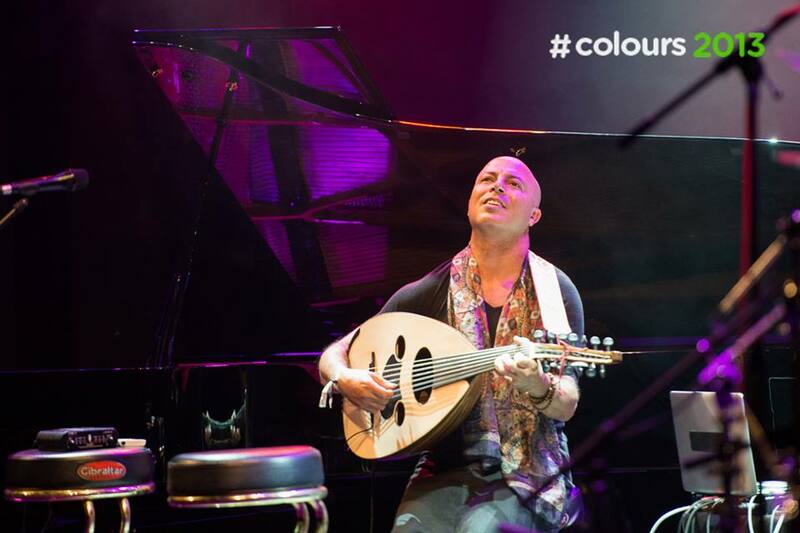 Without forgetting the artistic identity that he forged through his experience and permanent search for sonorities, Dhafer Youssef carries on transcending genres. 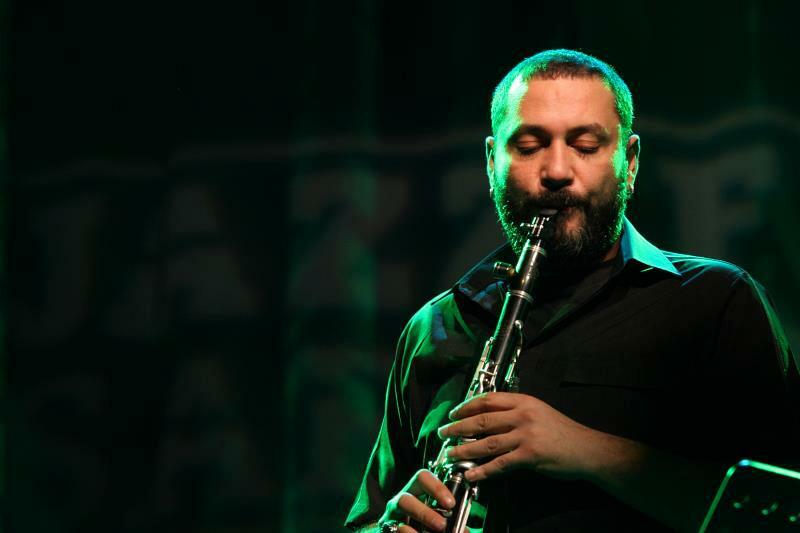 His quest leads him to clarinetist Hüsnü Şenlendirici and Kanun player, Aytaç Dogan. 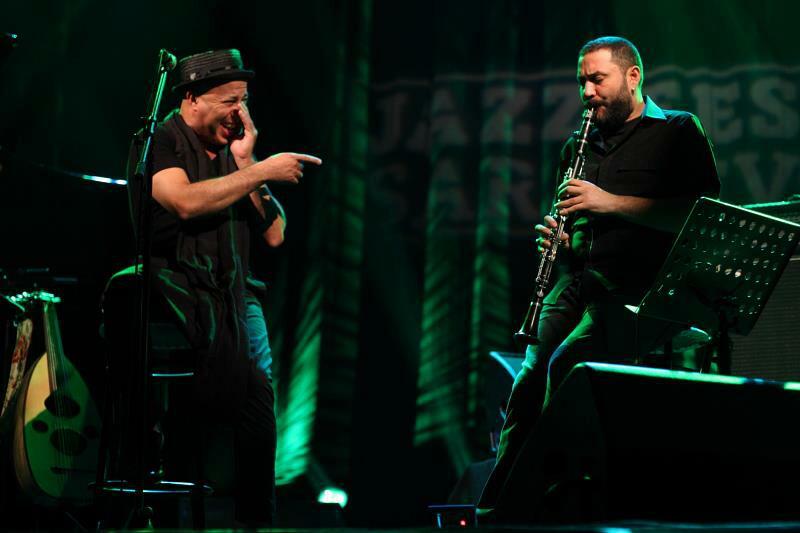 Dhafer Youssef’s voice accompanies Hüsnü Senlendirici‘s clarinet and Aytaç Dogan’s Kanun. Nils Petter Molvaer’s trumpet reinforces the atmospheric mood. 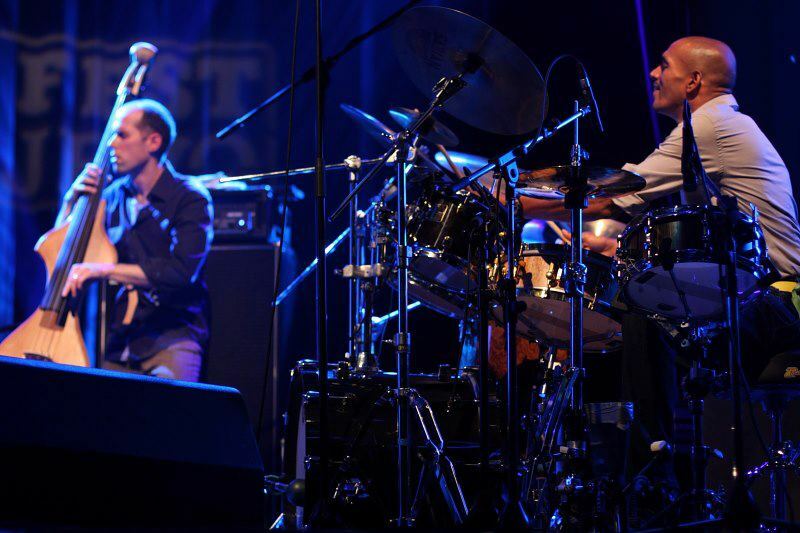 Eivind Aarset’s guitar, Kristjan randalu’s Piano, Phil Donkin’s double bass and Chander Sardjoe ‘s drums create a jazzy atmosphere. 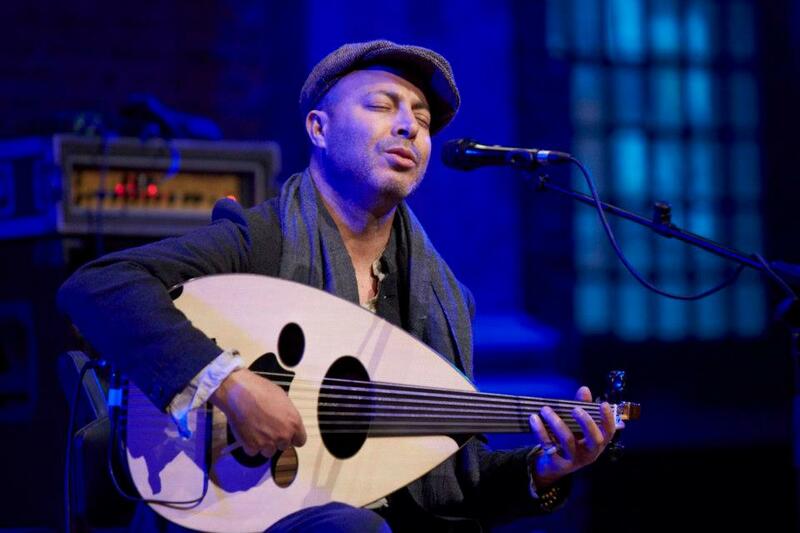 “Birds requiem” is the name of Dhafer Youssef’s new album, released on October 2013. This last opus is a very personal album that has been prepared at a turning point of the artist’s life, and at that moment, a return to the origins occurred-his but also the origins of music. 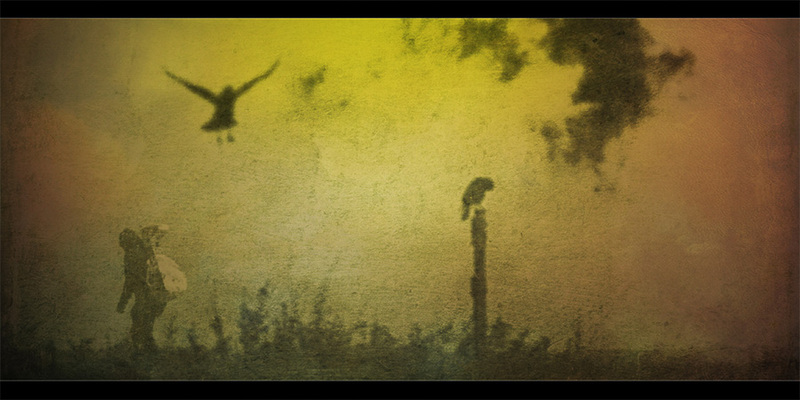 The album, structured around the Birds Requiem suite, (“Birds Canticum”, “Fuga Hirundinum”, “Archaic Feathers” and “Whirling Birds Ceremony”), is constructed as music for an imaginative movie. 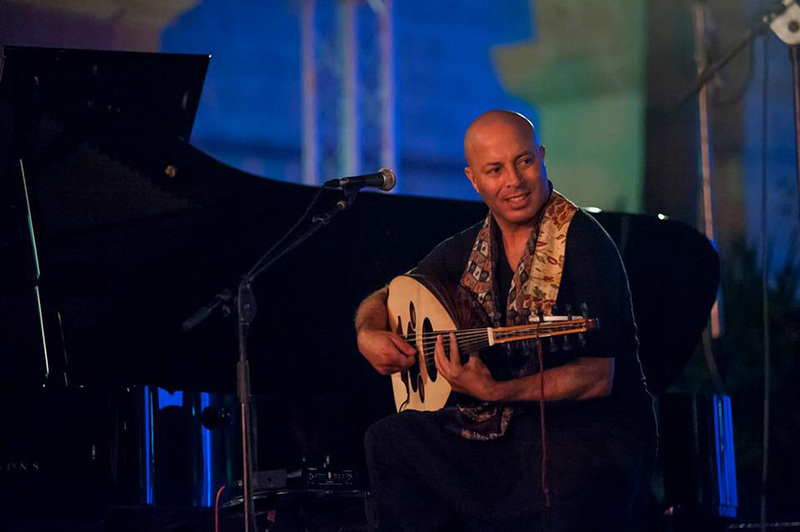 After El-hallaj and other Sufi philosophers and poets, Dhafer Youssef took his inspiration from Abu Nawas texts. The latter was a Persian poet from the VII th century renowned for his odes to wine in a conservative society. 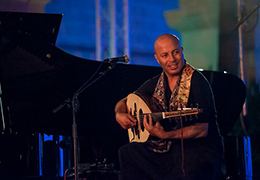 Released in 2010, “Abu Nawas Rhapsody” is the artist’s 6th album. 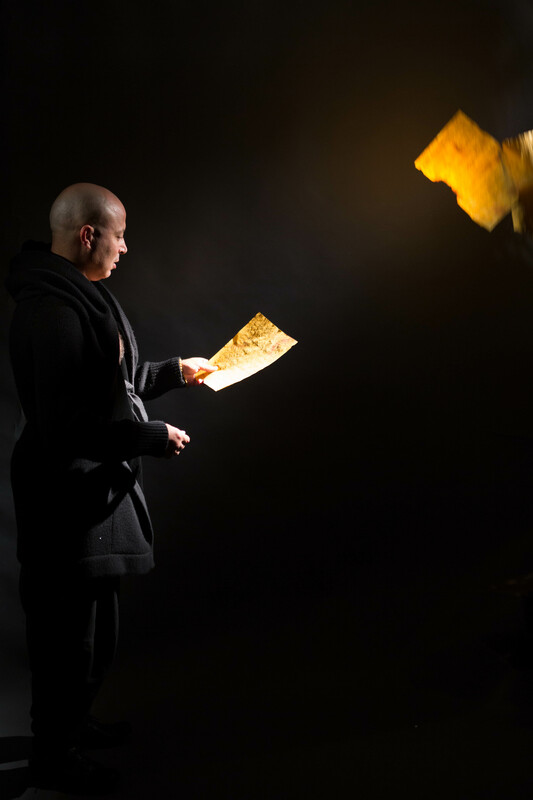 It is also a musical manifesto which removes the barriers between the notions of sacred and profane. 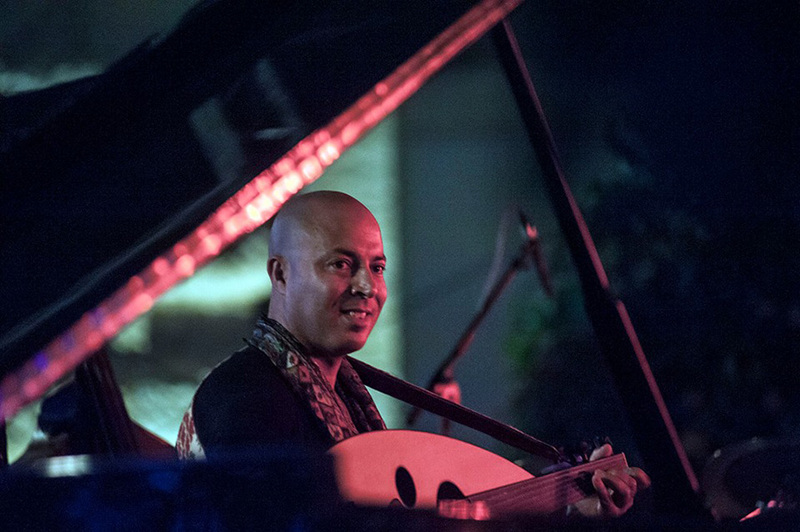 Accompanied with pianist Tigran Hamasyan, Mark Guiliana on drums and Double Bass player Chris Jennings, Dhafer Youssef goes back in his album “Abu Nawas Rhapsody” to a more Jazzy and groovy style. 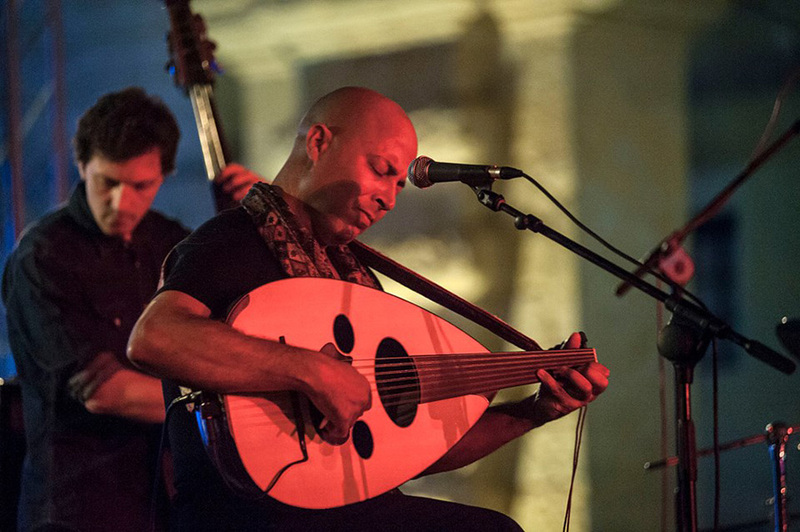 Dhafer Youssef’s powerful voice is introduced subtly before starting a vigorous fusion with the instruments. 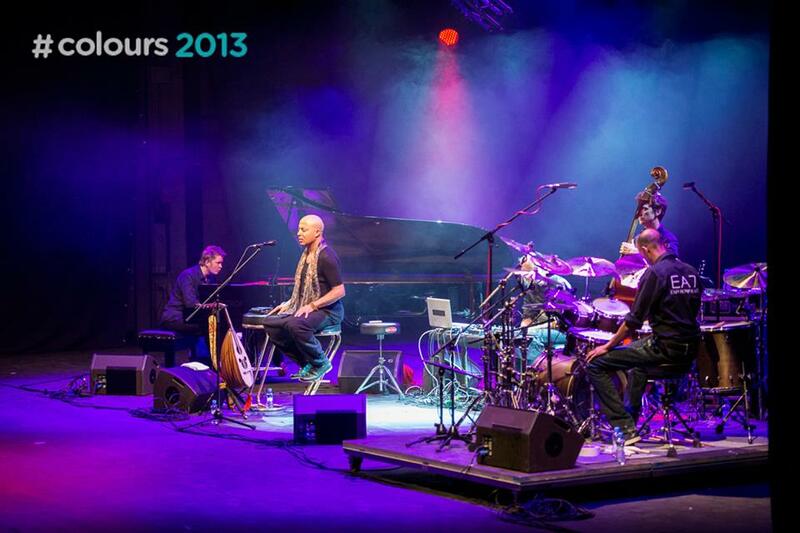 In 2004, Dhafer is invited by Norwegian producer, composer and pianist BuggeWesseltoft, on his album “Film Ing”. He collaborates with him on the song “Hope”. Far from being ephemeral, this new collaboration grows with the release of “Divine Shadows” (2005), under the label Jazzland Records, founded by BuggeWesseltoft. 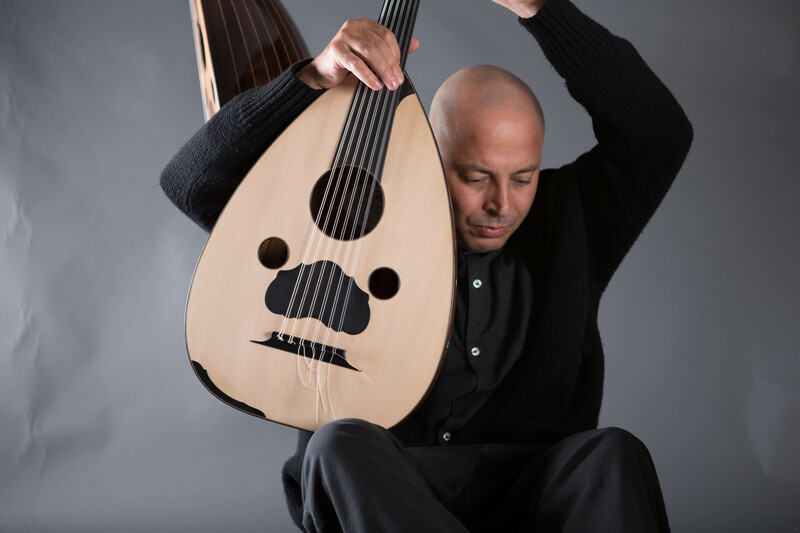 After these unlikely encounters between Oud and electronic music (Electric Sufi), Dhafer Youssef sets himself a new challenge which consisted in introducing more string instruments to his creative universe. This surrealist equation resolved with the release of “Divine Shadows” in 2005. The sound is resolutely thrilling without losing its ethereal aspect. Spiritualism is asserted manifesting itself without any complex and far from stereotypes. The album was marked by the arrival of Arve Henriksen and Marilyn Mazur together with the road companions Eivind Aarset, Audun Erlien, Rune Arnesen. 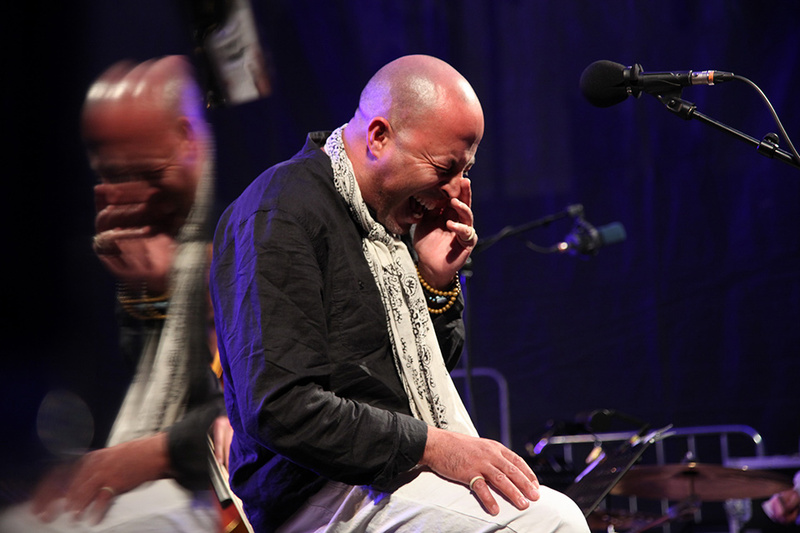 After a first nomination for the BBC awards for world music in 2003, “Divine Shadows” will bring him a new nomination in 2006. 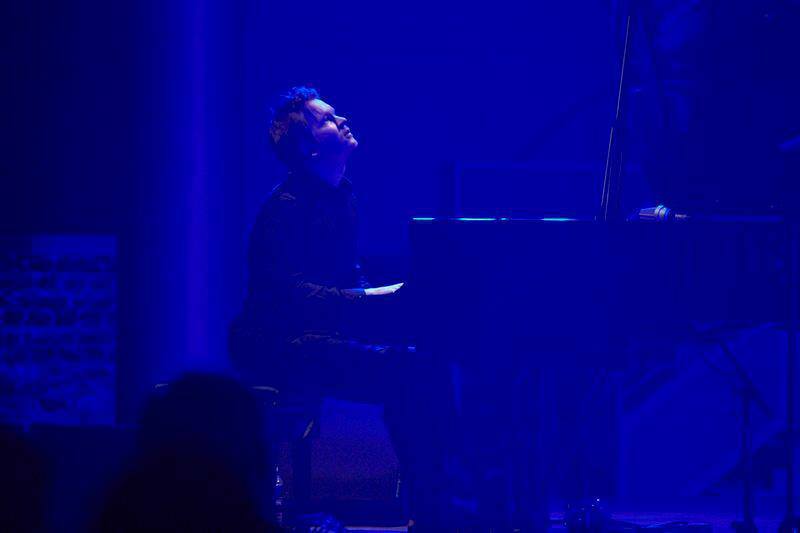 Recorded in Oslo (Norway) at 7.ETG, in Steinakirchen (Austria) at TSB and in Paris (France) at On-The-Fly. 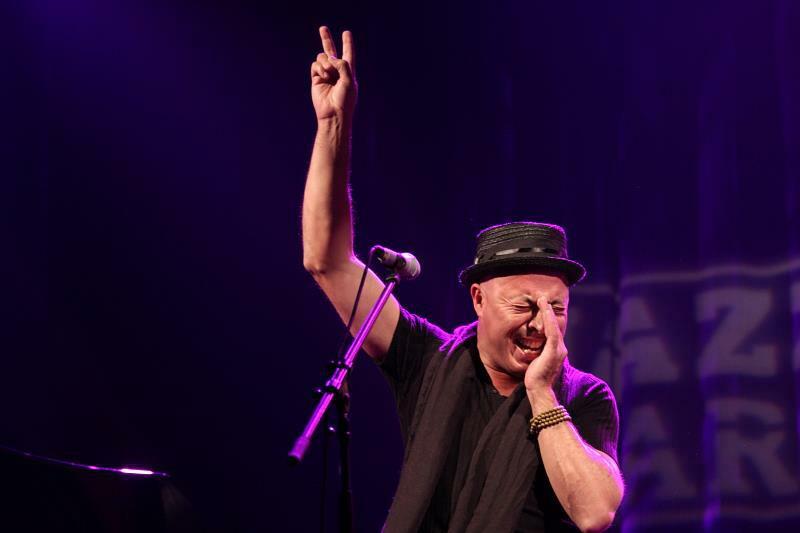 Producer – Bugge Wesseltoft Producer, Written-, Arranged By – Dhafer Youssef Written and Arranged By Dhafer Youssef – Except for tracks: 3, Dhafer Youssef and Bugge Wesseltoft and tracks:6, Dhafer Youssef and Ronu Majumdar. 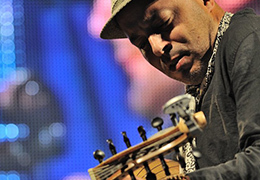 Dhafer Youssef: Oud-Vocals Eivind Aarset : Electric Guitar Dieter Ilg : Bass Rune Arnesen : Drums-Electronics Ronu Majumdar : Bansuri Bugge Wesseltoft : Piano Jan Bang : Electronics Nils Petter Molvear :Trumpet Engineer [Oslo] – Reidar Skaar Engineer [Paris] – Steve Argüelles Engineer [Steinakirchen] – Roland Baumann Mastered By – Wolfgang Meyscheider Mixed By, Edited By – Dhafer Youssef (tracks: 6), Eivind "Ben Svein" Aarset* (tracks: 1), Reidar Skaar* (tracks: 4 to 7), Steve Argüelles (tracks: 2, 3, 8 to 10) Other [Third Ear] – Paolo Vinaccia (tracks: 4, 5, 7) Photography – (C) 2003 Mephisto (Dhafer Youssef) Artwork By [Booklet], Photography [Booklet] – Jürgen Enninger, Manfred Brey Design – Brey Graphics Label : Enja. 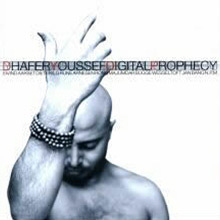 Back in the studios, Dhafer Youssef records “Digital Prophecy” in 2003.  The search of new sonorities intensifies and the result is exhilarating. 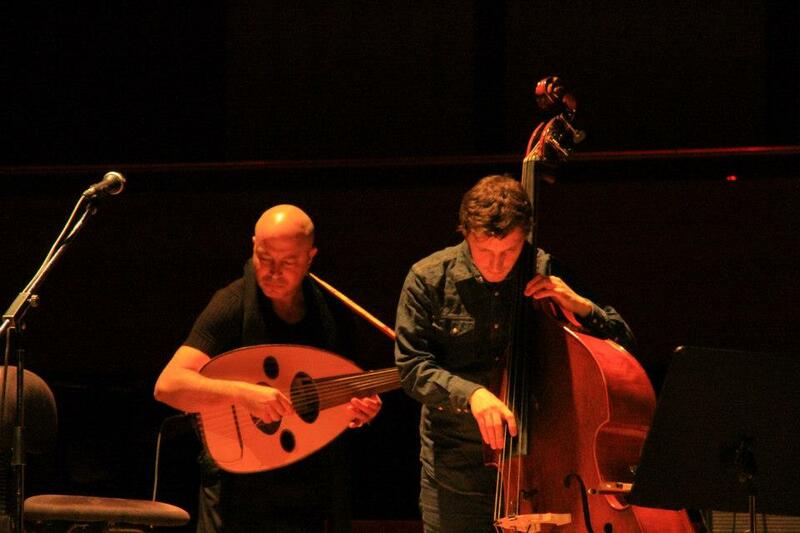 The symbiosis between the Oud and electric sonorities is more natural. 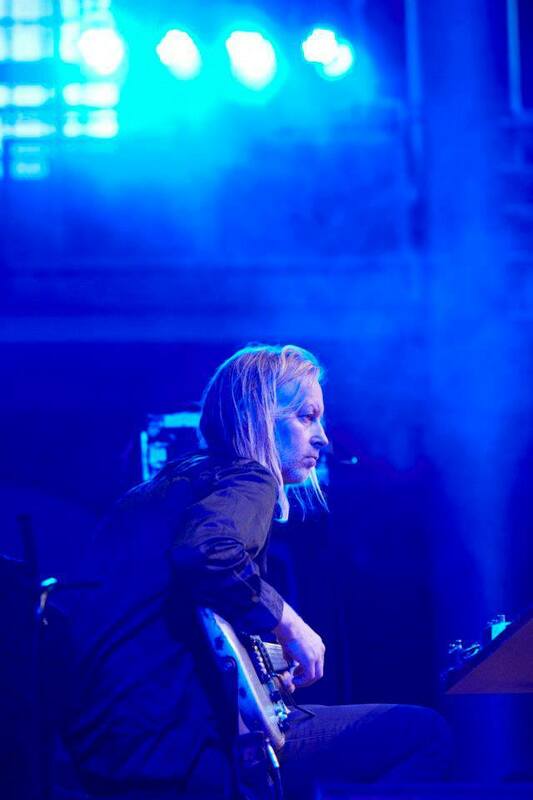 The alchemy operates between great artists from the electro-jazz Scandinavian scene. 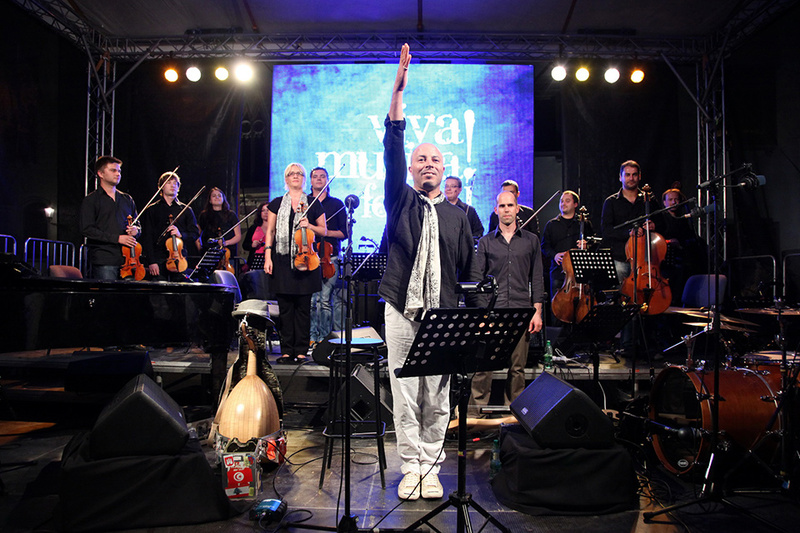 These artists are trumpetist Nils Petter Molvaer, pianist Bugge Wesseltoft, Guitarist Eivind Aarset, electric bass player Auden Erlien and Drummer Rune Arnesen and Bansuri player Ronu Majumdar. 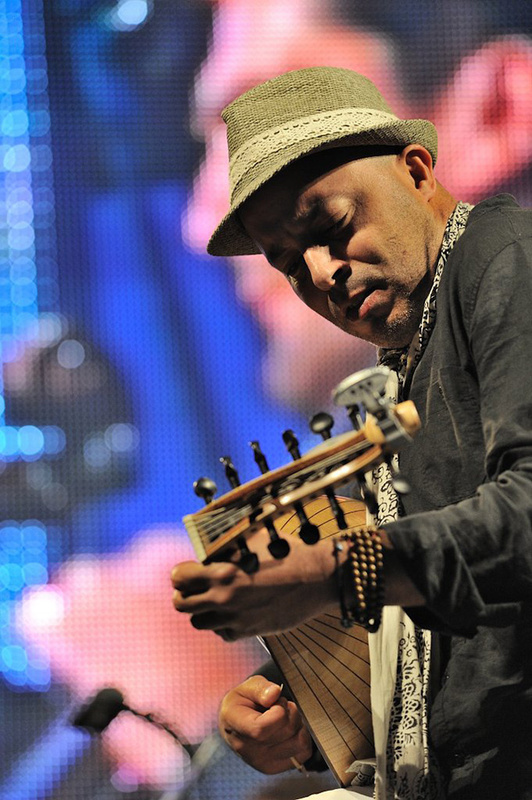 This great sound ascension gave Dhafer Youssef’s music more height bringing him, in 2003, a nomination for the BBC awards for world music. 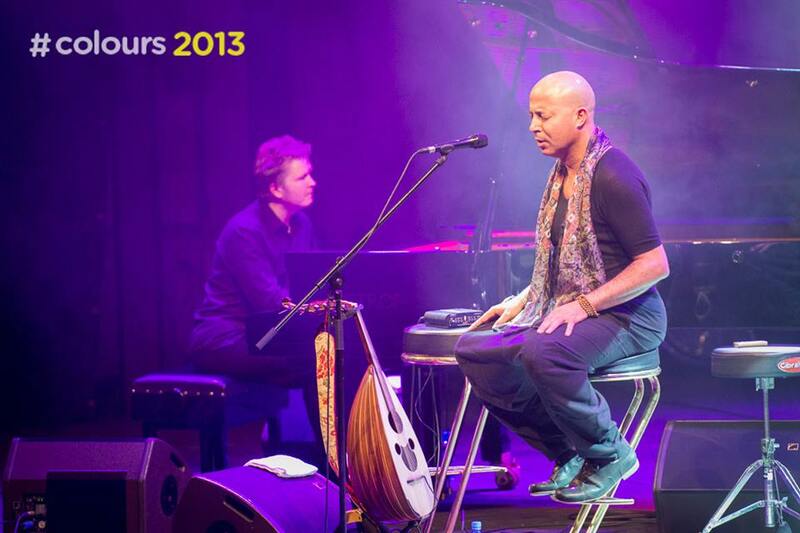 It's Dhafer Youssef at his hypnotic best. 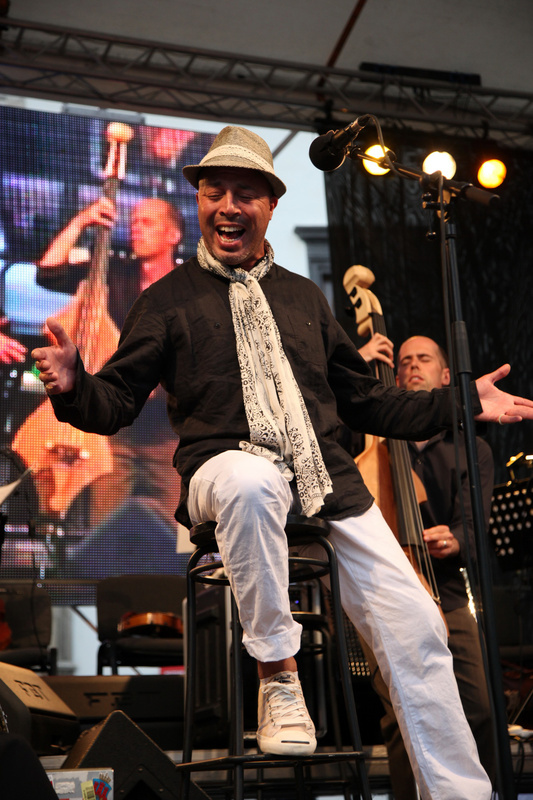 Acclaimed by the critics, he successfully went on a tour over Europe before going back to studios with a new project. 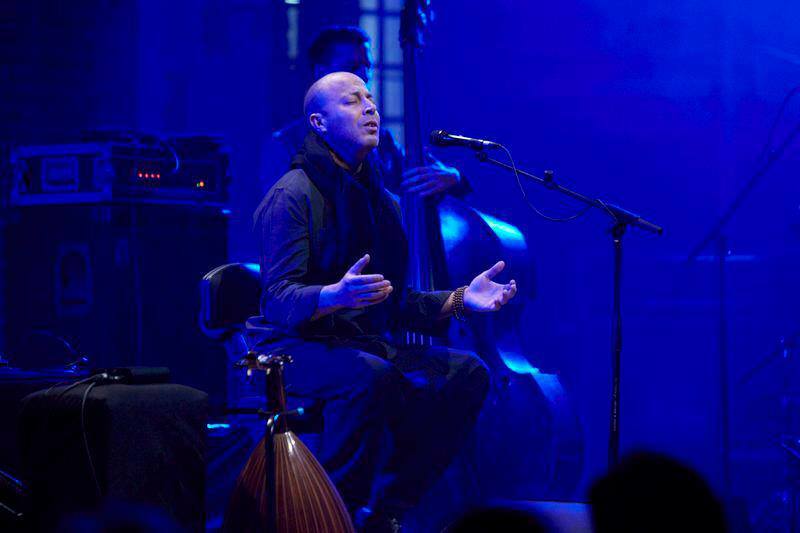 In 2001, Dhafer Youssef recorded “Electric Sufi” his second album with Enja Records. 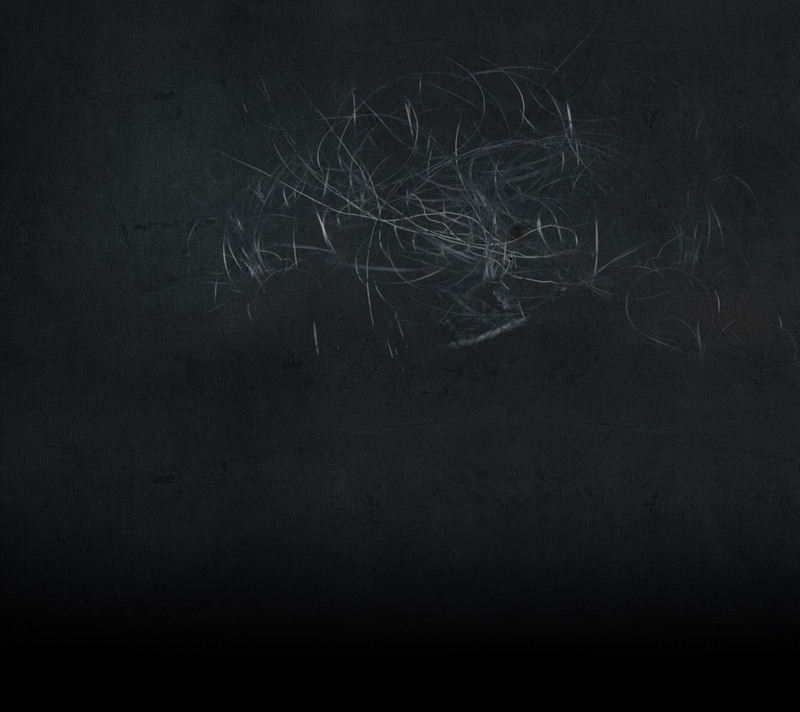 As its name suggests, this marks the musician’s first experience with electronic music. 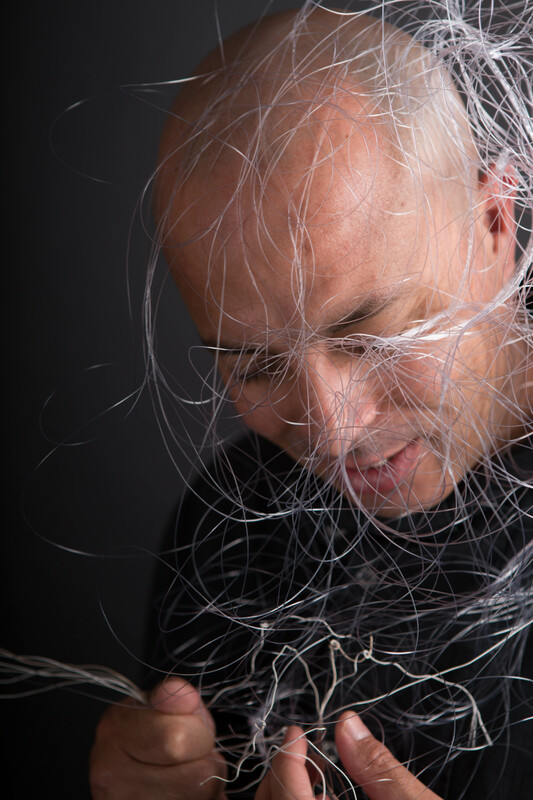 For this project, he collaborated with Wolfgang Muthspiel (Guitar), Markus Stockhausen (Trumpet), Deepak Ram (Bansuri), Dieter Ilg (Bass), Mino Cinelu (Percussion), Rodericke Packe (Electronics) as well as Will Calhoun (Drums) and Doug Wimbish (Bass). The sound mixture was exalting. 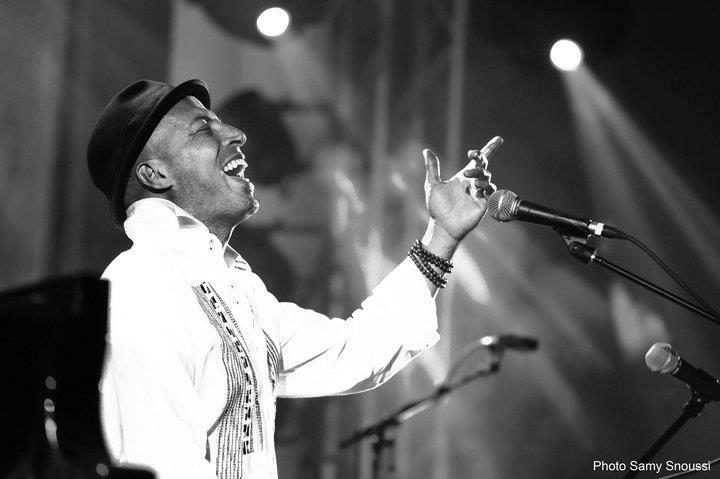 A result of his interest for his vocal undulations and the resonances of sounds, the jazz music in “Electric Sufi” was an opportunity for Dhafer Youssef to experiment new things with his voice and to use it as an instrument. 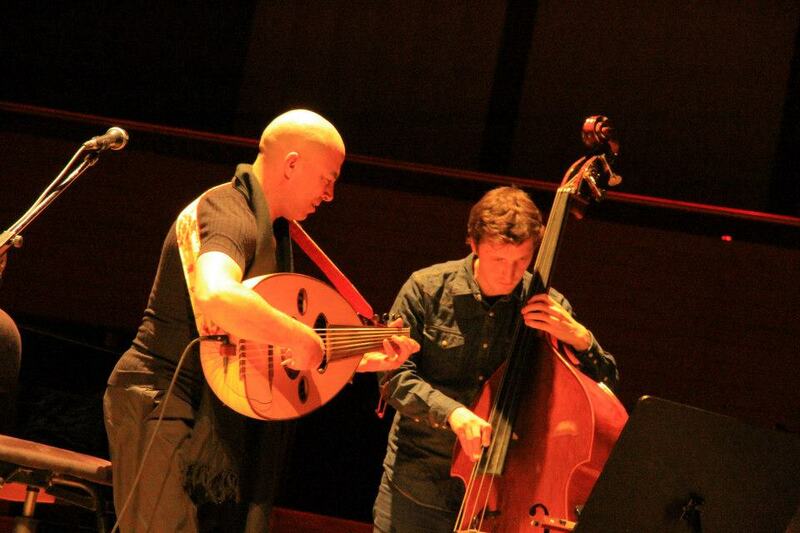 Dhafer Youssef: vocal, oud Markus Stockhausen: trumpet, flh. Nguyên Lê: guitar. 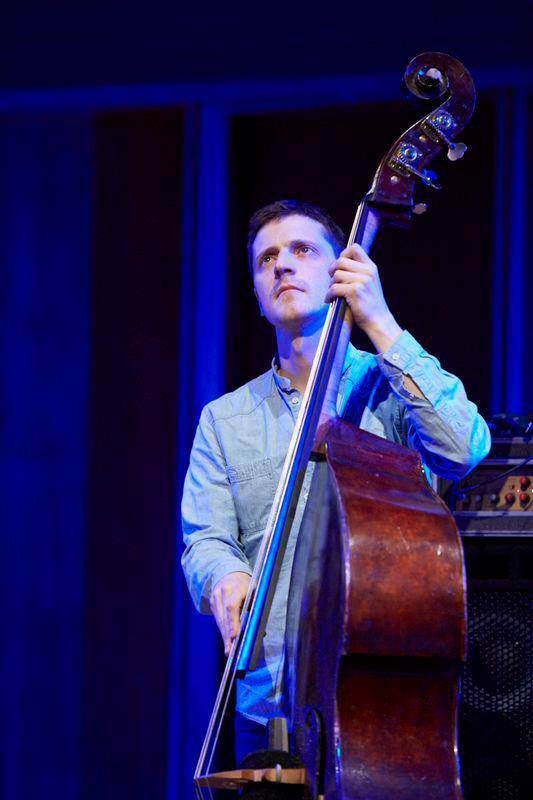 Renaud Garcia-Fons: bass. Deepak Ram: bansuri. Zoltan Lantos: violin. 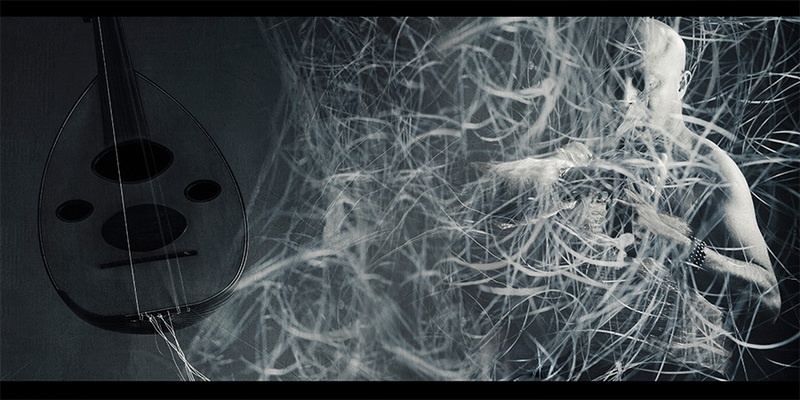 Achim Tang: bass. 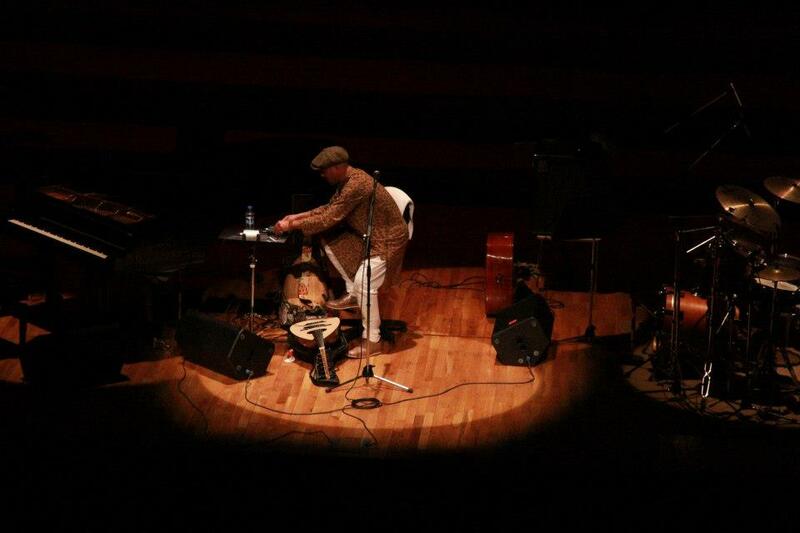 Jatinder Thakur: tabla, dolak. 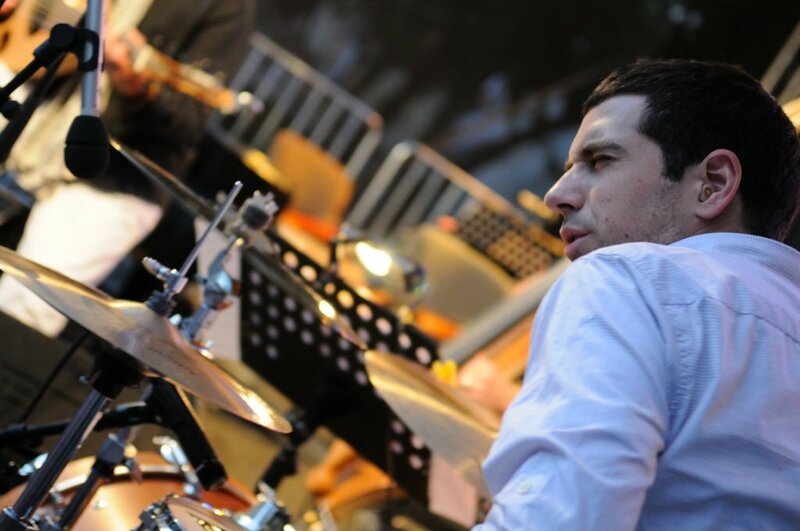 Patrice Héral: drums. Carlo Rizzo: tambourine. All compositions written and arranged by Dhafer Youssef (1)by Dhafer Youssef and Renaud Garcia Fons (6) By Dhafer Youssef, Markus Stockhaussen and Nguyën Lê recorded at feedback studio,Vienna, Austria recording engineer :Reinhard Buchta,Mixed and Edited by Georg Mittermayr and Peter Kaizar at the creative sound compagny,Vienna,Austria. Mastered by Walter Quintus. Produced by : Dhafer Youssef photography by Werner Schrödl Design : Brey Graphics Label : Enja. 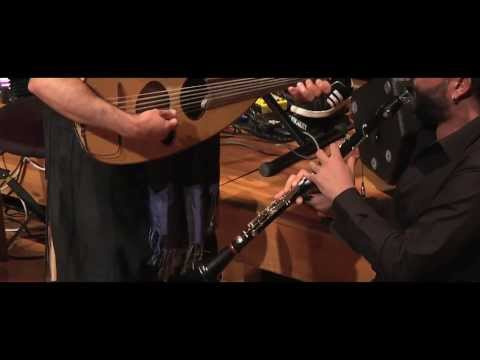 In 2011, he invites Turkish clarinetist Hüsnü Senlendirici and Kanun player Aytaç Dogan to a performance in Ludwigsbourg-Germany.In 2013 and inspired by this encounter, Dhafer Youssef releases "Birds Requiem." The success of this album immediately praised by critics is unprecedented, with a triumphant international tour of about 100 concerts, over 50,000 records sold and performances by several orchestras including the London Symphony Orchestra. 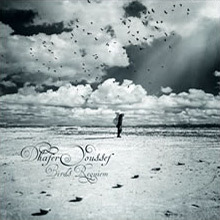 Constructed as a film soundtrack, “Birds Requiem” is a very personal album that was recorded at a turning point of the artist's life. 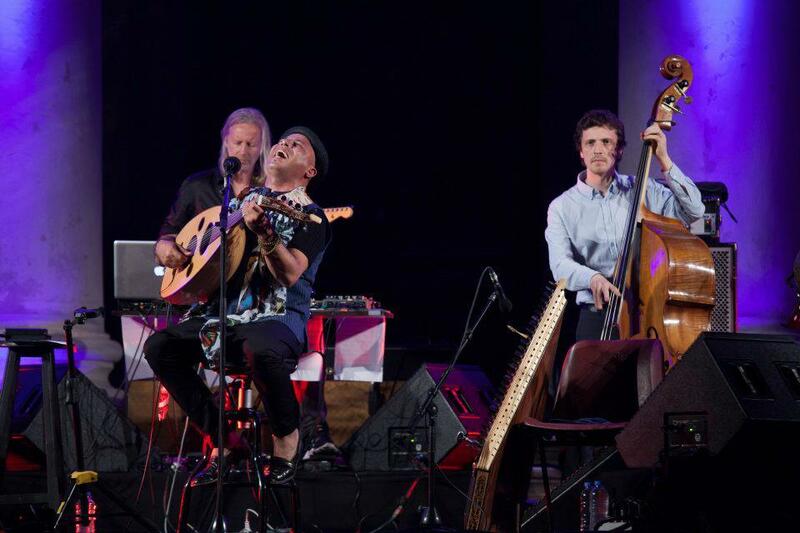 Dhafer Youssef's voice accompanies the clarinet of Husnu Senlendirici and the Kanun of Aytaç Doğan. 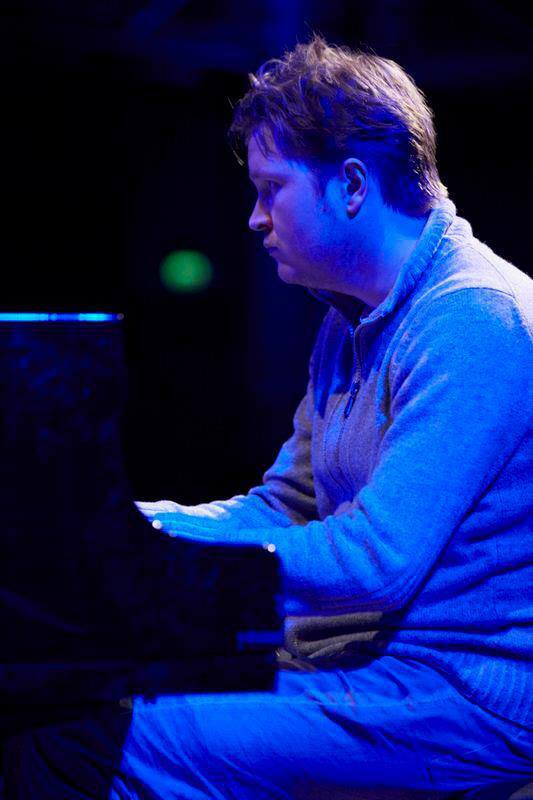 He also collaborates again with his comapnions Eivind Aarset on the electric guitar, Nils Petter Molvaer on the trumpet, Kristjan Randalu on the piano, Phil Donkin on the bass and Chander Sardjoe on drums. “Birds Requiem” is ranked among the ten best jazz albums in France and elsewhere, and included in the list of "Best 20 male vocalists" by DownBeat Magazine. 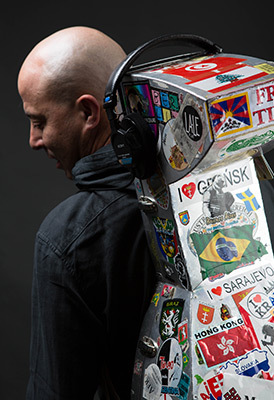 It is a new milestone in Dhafer’s career and musical research. 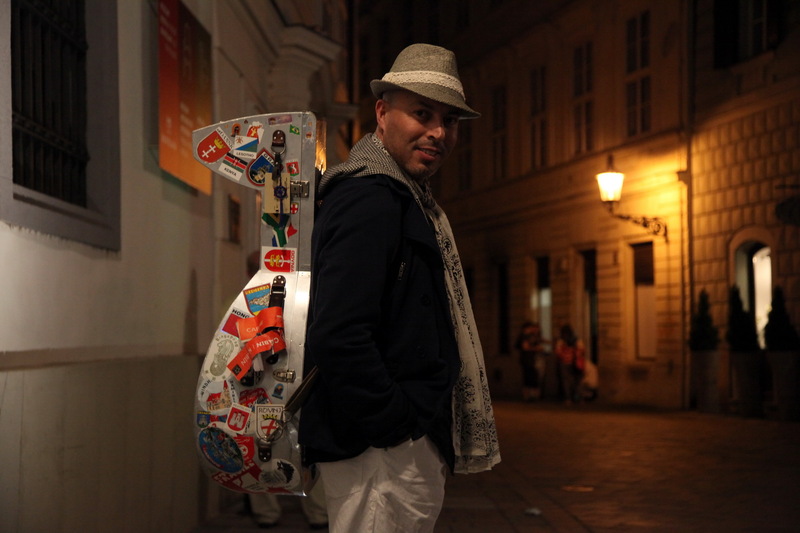 The atypical artistic adventure of Dhafer takes him back to New York in 2016, a city where he lived for a few years in his beginnings, and that he is particularly fond of. It is in this vibrant city that the genesis of the most anticipated album of 2016 takes place: “Diwan Of Beauty and Odd” is recorded in the legendary Sear Sound studio, with undoubtedly the finest musicians the New York jazz scene could offer: Aaron Parks on the piano, Ben Williams on the bass, Mark Guiliana on the drums and Ambrose Akinmusire on the trumpet. 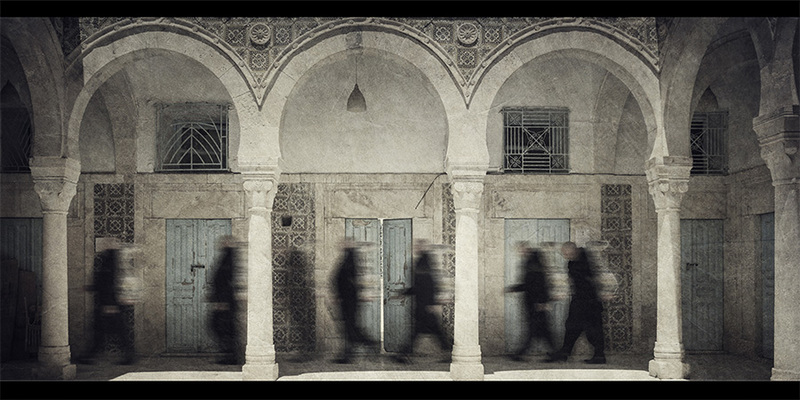 The 11 compositions of “Diwan Of Beauty And Odd” are an exploration of one of most attractive dualities, that of the beautiful and the strange. 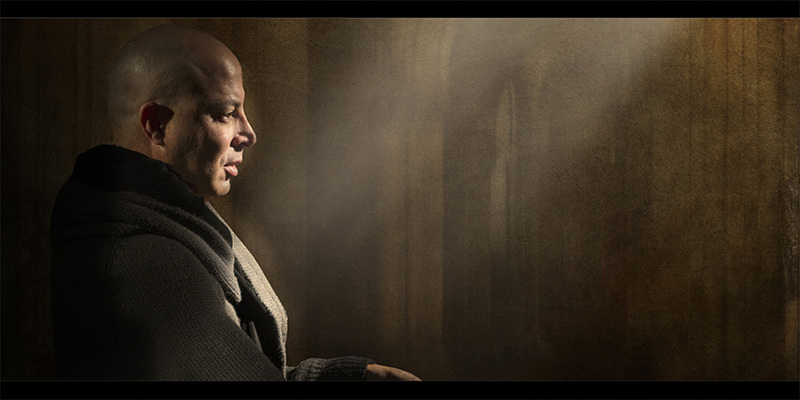 With his extraordinary ability to transcend genres and the limits of simple meters, Dhafer plays with the asymmetrical quality of odd meters to deliver a musical feat of intriguing complexity that yet remains infinitely beautiful and apprehensible. That is where the genius of the composer resides. “Diwan of Beauty And Odd” is a fusion of oriental influences and the urban groove of New York. It is a vibrant encounter of tradition and contemporary influences, a universal call for peace subtly delivered. 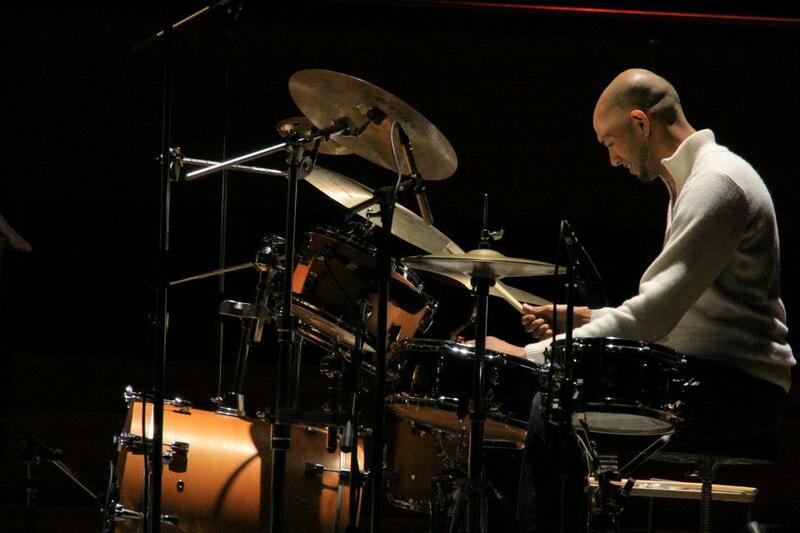 The album to be released on September 16, 2016 is a feat of musicianship where the consummate Tunisian composer asserts his position as one of the most innovative musicians of the last decade. 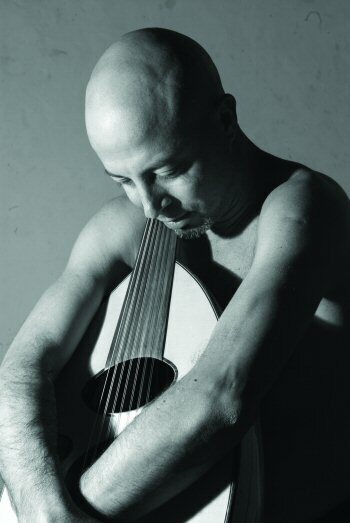 Né le 19 novembre 1967 à Teboulba, Dhafer Youssef est un maitre du Oud, vocaliste et compositeur tunisien. Enfant d’une modeste famille originaire de ce village de pêcheurs du centre-est tunisien, il est issu d’une longue lignée de muezzins. La maitrise de la performance vocale est pour lui un héritage. Dès son plus jeune âge, son grand-père l’initie au récital coranique. Ainsi a-t-il commencé à découvrir le potentiel de sa voix. Une vocation est née. 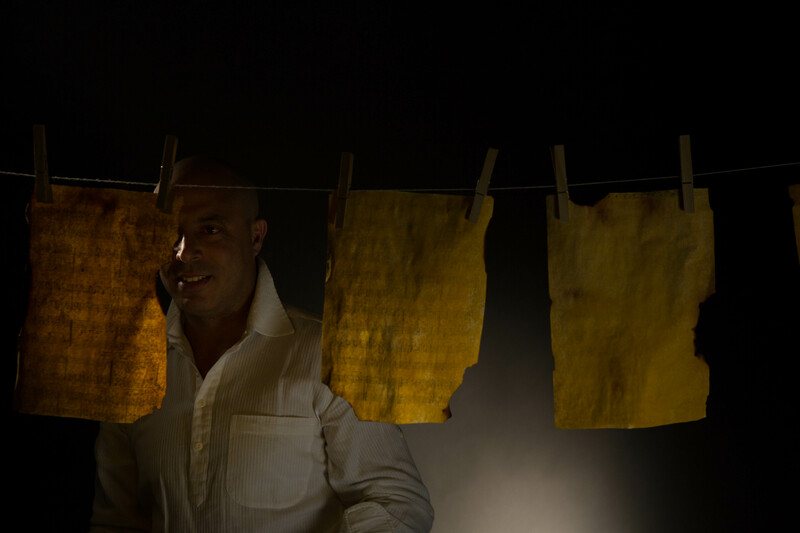 Aspirant à découvrir de nouveaux horizons, Dhafer Youssef quitte son village natal vers la capitale. 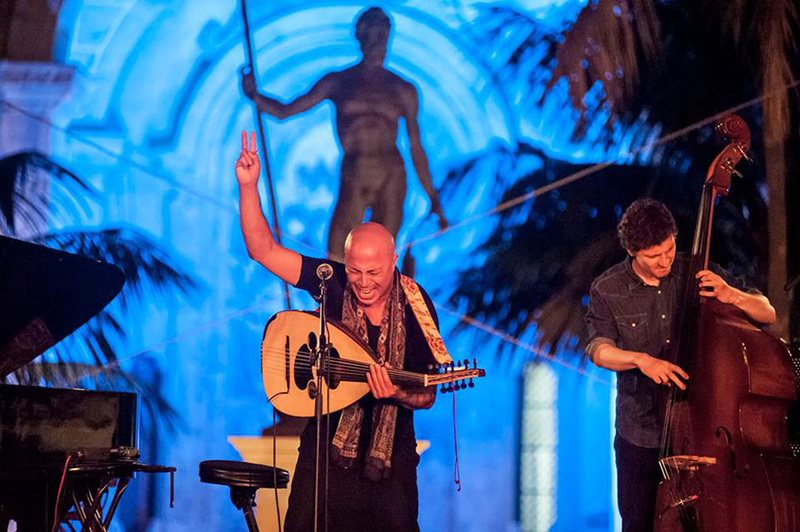 A Tunis, il rejoint le Conservatoire de Nahj Zarkoun. Insatisfait de la qualité de l’enseignement, il quitte la Tunisie pour l’Autriche avec l’ambition de parfaire sa formation musicale. L’ivresse créative procurée par le multiculturalisme viennois lui permet de découvrir un monde aux possibilités diverses. Après avoir entamé des études de musicologie, il se rend compte que la formation académique ne l’intéresse pas vraiment. Séduit par le jazz ainsi que d’autres musiques du monde à l’instar de la musique indienne, il sillonne les clubs et les bars de musique live multipliant les rencontres, notamment celle de l’emblématique saxophoniste autrichien Wolfgang Puschnig. Lors d’une jam, il fait la connaissance de Gerhard Reiter. 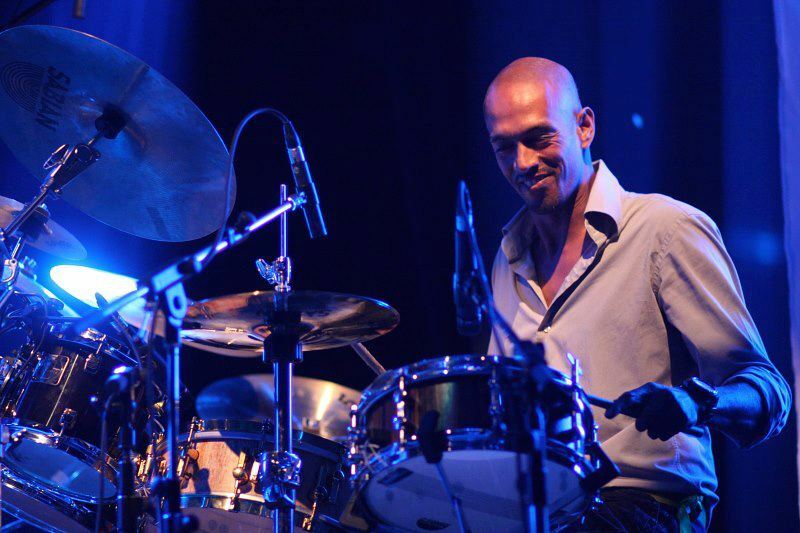 C’est avec ce percussionniste autrichien qu’il crée son premier groupe «Zeryab». En 1996, ces multiples découvertes et expériences à Vienne donnent vie à son premier disque «Musafir» (Le Voyageur, en arabe). 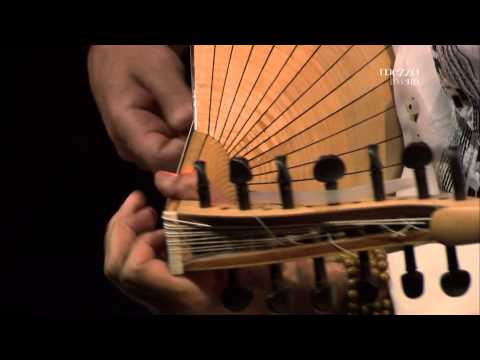 Cet opus est le fruit de diverses rencontres qui marqueront à jamais la musique de Dhafer Youssef et lui insuffleront cette atypique dimension universelle. Le musicien indien Jatinder Thakur montre avec les rythmes de sa tabla une voie riche en possibilités. Les mélodies du violoniste autrichien Anton Burger les multiplient. L’accordéon du musicien autrichien Otto Leichner leur donne des couleurs. Et le contrebassiste allemand Ackim Tang offre de la consistance à cet indigo musical. 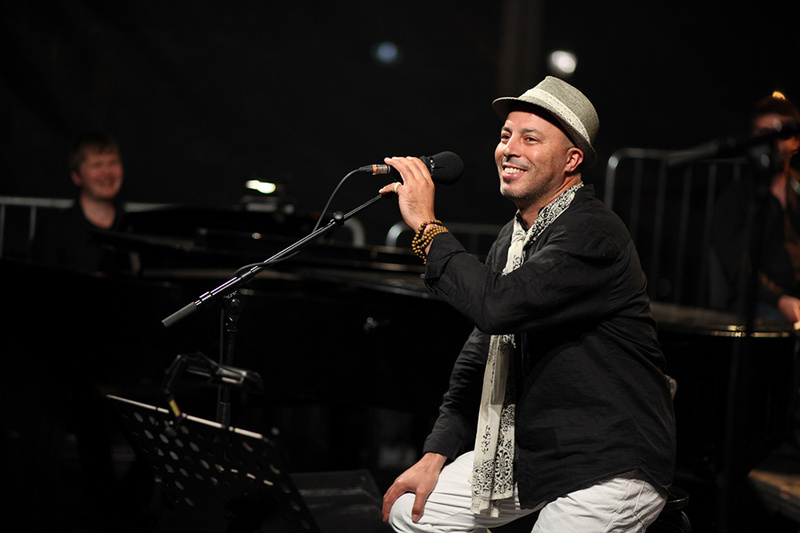 Dhafer Youssef présente son projet à Porgy & Bess, club viennois de renom. Après une première soirée très appréciée, le club lui donne carte blanche. Il y entame dès lors un cycle de concerts mensuels. Encore plus de rencontres s’y font dont l’une des plus importantes demeure celle avec le guitariste français d’origine vietnamienne Nguyen Lê. Le chemin de Dhafer croise aussi celui du trompettiste italien Paolo Fresu qui l’invite à partager la scène lors de nombreuses performances dans divers pays européens. 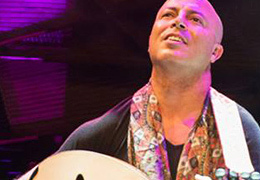 Au fil des concerts, Dhafer Youssef gagne en maturité. Le constat s’affirme avec la sortie de «Malak» en 1999 sous le label Enja Records. Le groove méditerranéen y prend une couleur particulière à l’ombre des structures mélodiques du jazz européen. Le penchant lyrique s’y manifeste avec subtilité. De quoi marquer le début d’une identité musicale authentique imprégnée de ses origines sans tomber dans l’orientalisme typique. 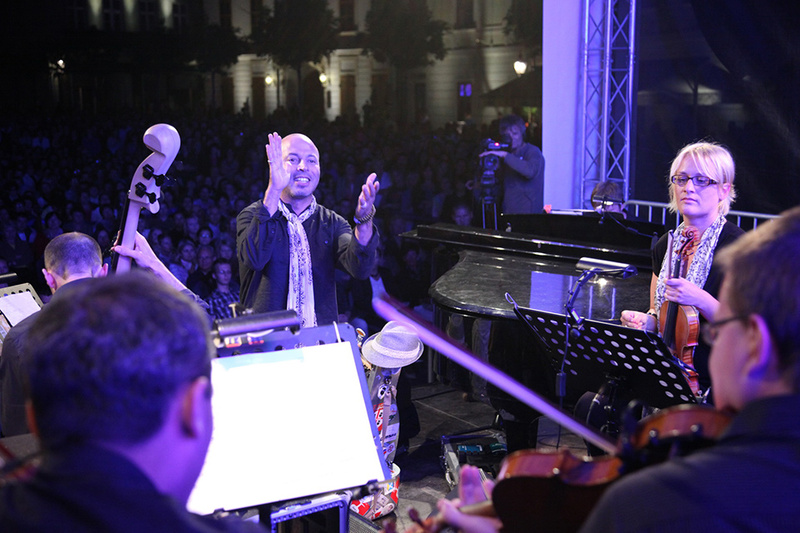 Accompagné de Nguyen Lê à la guitare, Markus Stockhausen à la trompette, Achim Tang à la basse et Patrice Heral à la batterie, Dhafer se trouve propulsé dans une carrière internationale. Encensé par la critique, il sillonne les scènes européennes avec succès avant de regagner le studio en 2001 pour un nouveau projet discographique : «Electric Sufi», son deuxième album avec Enja Records. Il s’agit de sa première expérience avec la musique électronique. Pour l’occasion, il collabore avec Wolfgang Muthspiel (guitare), Markus Stockhausen (trompette), Deepak Ram (bansuri), Dieter Ilg (basse), Mino Cinelu (percussions), Rodericke Packe (électronique) ainsi que Will Calhoun (batterie) et Doug Wimbish (basse). Le cocktail sonore est enivrant. 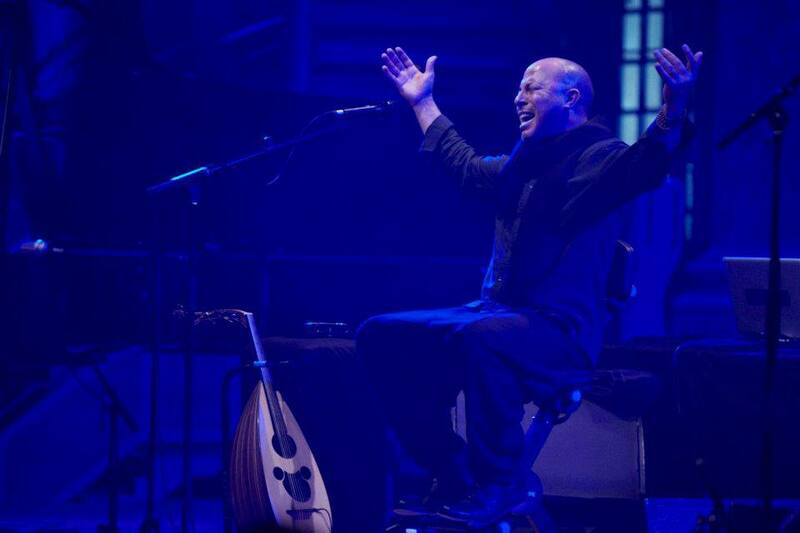 Fruit de son intérêt obsessionnel pour les ondulations vocales et les résonnances sonores, la musique aux couleurs jazz d’«Electric Sufi» est un terrain fertile où la voix de Dhafer Youssef s’aventure dans l’expérimentation et s’affirme comme un instrument à part entière. 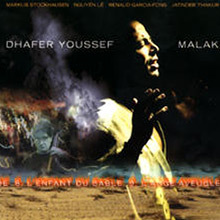 De retour au studio après une tournée inspirante, Dhafer Youssef réalise «Digital Prophecy» en 2003. La recherche s’intensifie. Le résultat est une véritable symbiose entre l’oud et les sonorités électroniques. Dans cette collaboration, l’alchimie opère entre Dhafer et des artistes phares de la scène electro jazz scandinave : le trompettiste Nils Petter Molvaer, le guitariste Eivind Aarset, Audun Erlien à la basse électrique et Rune Arnesen à la batterie. Cette véritable ascension sonore donne à la musique de Dhafer plus d’altitude et lui vaut deux nominations aux BBC Awards for World Music en 2003. 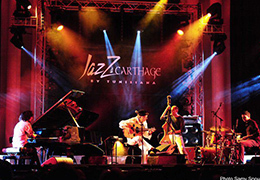 En 2004, Dhafer est invité par le producteur, compositeur et pianiste norvégien Bugge Wesseltoft sur son album «Film Ing». Il collabore avec lui sur le morceau «Hope». 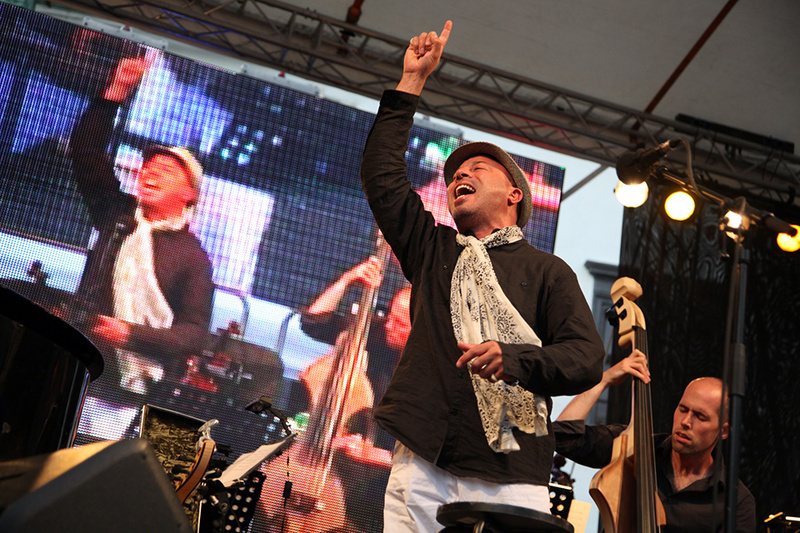 Loin d’être éphémère, cette collaboration prend de l’ampleur avec la parution de «Divine Shadows» (2005) et «Abu Nawas Rhapsody» (2010), sous le label Jazzland Records, fondé par Bugge Wesseltoft. 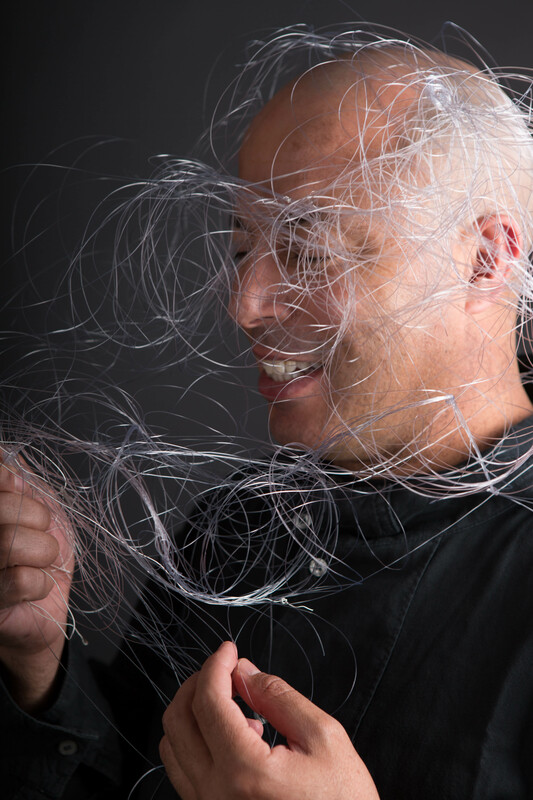 Après ces improbables rencontres entre oud et musique électronique, Dhafer Youssef se fixe un nouveau défi : introduire plus d’instruments à cordes dans son univers créatif. Cette équation aux allures surréalistes se résout en 2005 avec la sortie de «Divine Shadows». Le son est résolument palpitant, sans perdre son caractère aérien. Le spiritualisme s’affirme et s’y manifeste sans complexes et bien loin des stéréotypes. La formation est alimentée par l’arrivée d’Arve Henriksen (trompette) et de Marilyn Mazur (percussions) sans oublier les compagnons de route Eivind Aarset, Audun Erlien, Rune Arnesen. 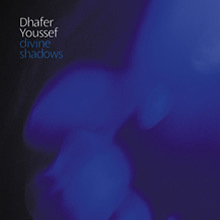 Après une première nomination en 2003 pour les BBC Awards for World Music, «Divine Shadows» vaut à Dhafer une deuxième nomination en 2006. Après Djalal Eddine Rûmi, El-Hallaj et autres philosophes et poètes soufis, Dhafer Youssef puise son inspiration dans les textes d’Abu Nawas, poète persan du VIIème siècle connu pour ses odes au vin dans la société conservatrice de son époque. Sorti en 2010, «Abu Nawas Rhapsody» est le sixième disque de l’artiste. Il s’agit d’un manifeste musical de la chute des barrières entre sacré et profane. Accompagné par le pianiste Tigran Hamasyan, le batteur Mark Guiliana et le contrebassiste Chris Jennings, «Abu Nawas Rhapsody» reprend une veine jazz ultra groovy. La puissance de la voix de Dhafer s’immisce discrètement, avant de s’insurger contre les autres instruments, indomptable, entrainant une ivresse musicale. Le talent de Dhafer Youssef s’étend au monde de la musique de film. 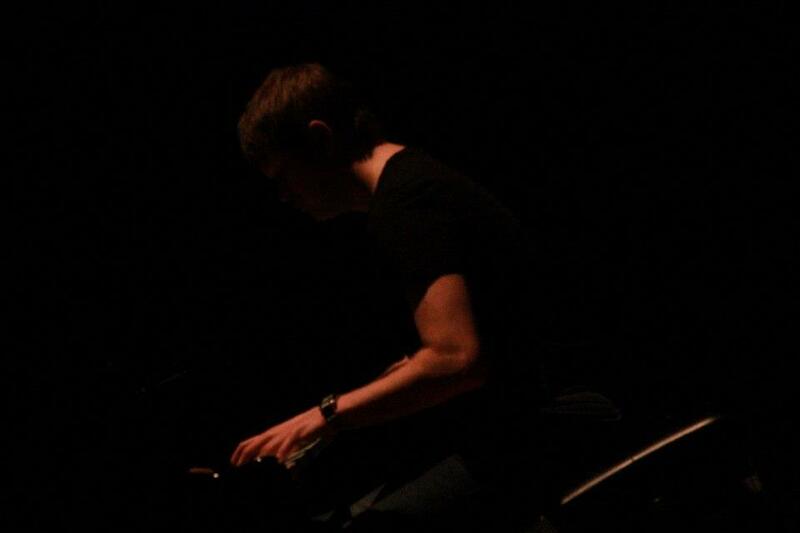 Les critiques relèveront sa performance exceptionnelle la bande originale de « Black Gold » composée et dirigée par le légendaire James Horner en 2011. Celui-ci invite Dhafer à une nouvelle collaboration en 2012 dans la bande originale de « The Amazing Spider-Man». 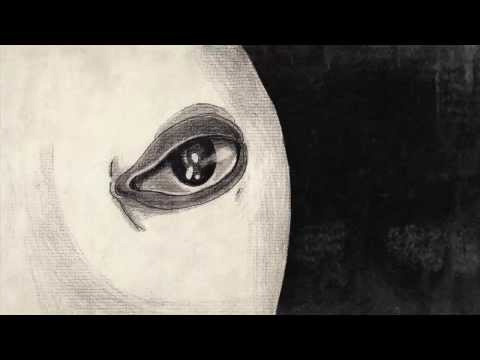 D’autres exemples incluent « Luna » de Dave McKean en 2014 ou encore une collaboration la même année avec Alberto Eglesias pour « Gods and Kings » de Ridley Scott. 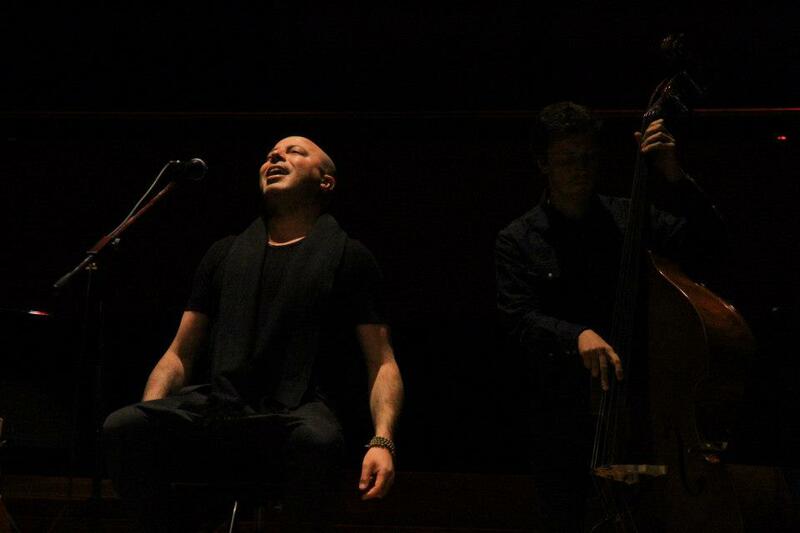 En 2013 et inspiré par cette rencontre, Dhafer Youssef présente au public sa nouvelle création, «Birds Requiem ». L’album connait un succès inédit avec une tournée internationale triomphale d’environ 100 concerts, plus de 50,000 disques vendus et des interprétations par plusieurs orchestres dont le London Symphony Orchestra. Construit comme une musique de film, cet opus est un album très personnel qui a été enregistré à une période charnière de la vie de l’artiste. 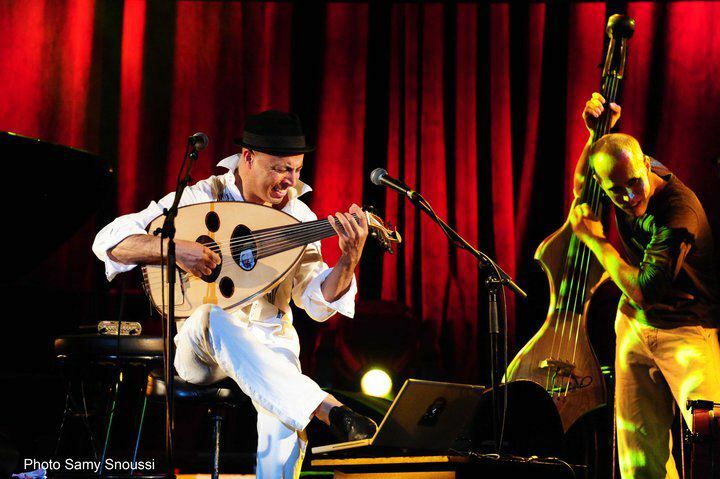 La voix de Dhafer Youssef y accompagne la clarinette de Husnu Senlendirici et le Kanun de Aytaç Dogan. Il retrouve également ses acolytes Eivind Aarset à la guitare éléctrique, Nils Petter Molvaer à la trompette, Kristjan Randalu au piano, Phil Donkin à la contrebasse et Chander Sardjoe à la batterie. L’album est encensé par la critique internationale et classé parmi les dix meilleurs albums de Jazz en France et ailleurs, et nommé dans la catégorie « Best 20 male vocalists » par le DownBeat Magazine. 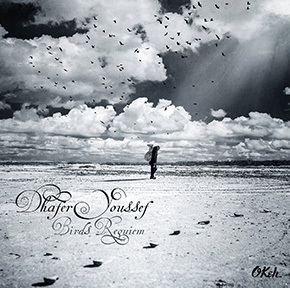 C’est en effet une nouvelle étape dans sa recherche musicale que Dhafer Youssef franchit avec « Birds Requiem ». Quelle reconnaissance alors de la part de nul autre que l’ambassadeur du International Jazz Day, maitre Herbie Hancock avec qui Dhafer jouera en duo ce soir-là, ou encore Wayne Shorter qui l’accompagnera avec son saxophone dans l’interprétation de « Haystan Dance». L’incroyable parcours de Dhafer le ramène en 2016 à New York, ville où il a vécu plusieurs années à ses débuts et qui occupe une place bien particulière dans son cœur et son imagination. C’est là qu’a lieu la genèse de l’album le plus attendu de 2016 « Diwan Of Beauty And Odd ». 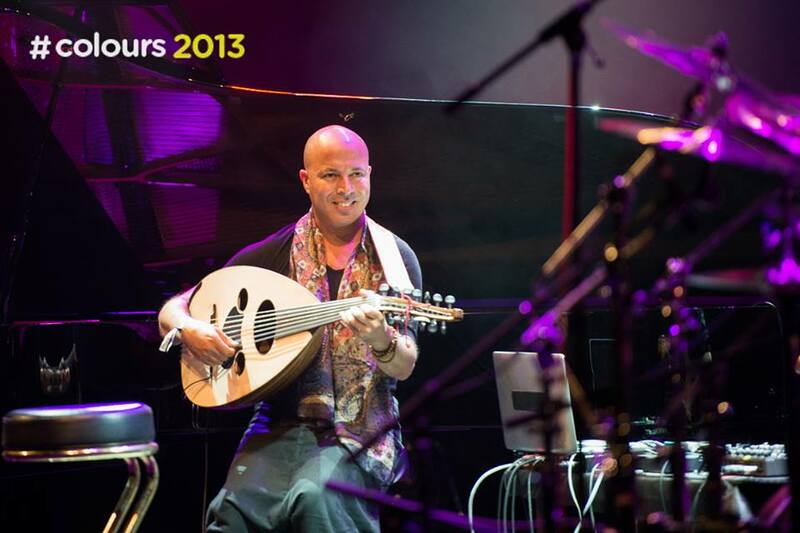 Le nouvel opus de Dhafer Youssef est enregistré dans le mythique studio new-yorkais Sear Sound. 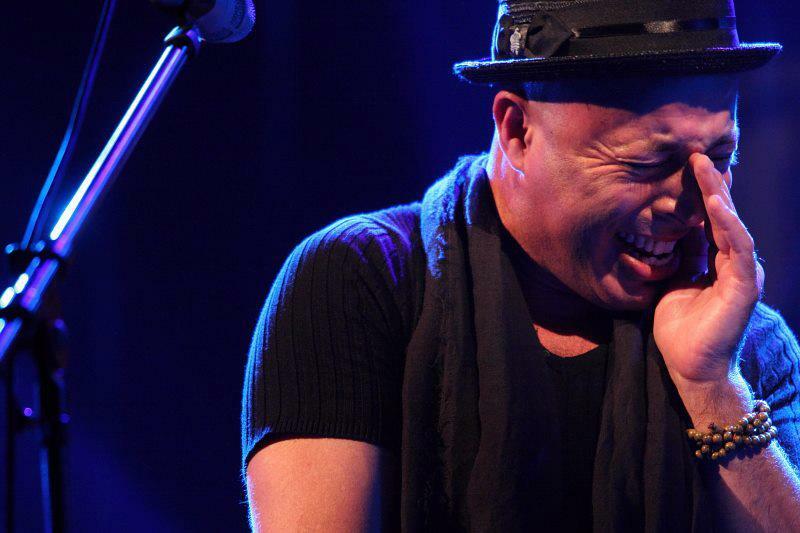 Dhafer s’y fait accompagner de la fine fleur du jazz new-yorkais : Aaron Parks au piano, Ben Williams à la basse, Mark Guilliana a la batterie et Ambrose Akinmusire à la trompette. L’alliage des influences orientales au groove urbain et new-yorkais, et de la tradition et du contemporain offrent à travers ce nouveau projet un message de paix universel subtilement délivré. 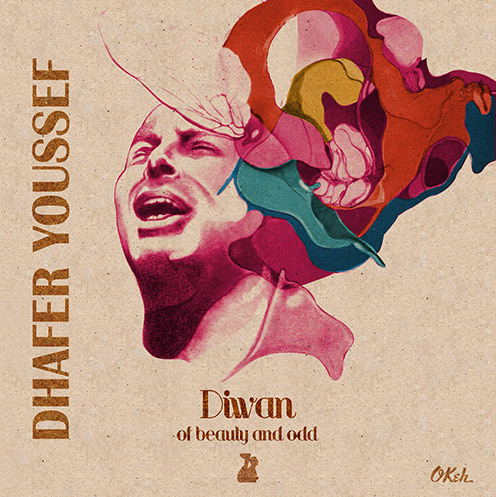 Infatigable explorateur, Dhafer Youssef nous offre dans Diwan Of Beauty And Odd une dualité des plus séduisantes, celle du beau et de l’étrange. Avec sa capacité extraordinaire à transcender les genres et les frontières des mesures simples, il joue avec l’asymétrie des temps impairs pour nous livrer une musique intrigante de sa complexité mais dont la beauté demeure appréhensible car universelle. Le génie de cet album est qu’il est ainsi à l’image de notre monde, complexe, construit sur des opposes néanmoins complémentaires, et fondamentalement beau et poétique même dans ses aspects les plus étranges. 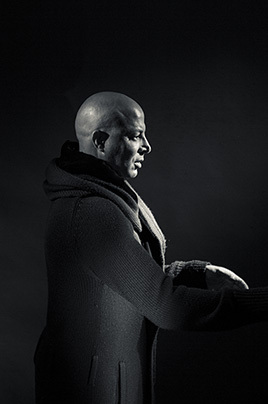 Dhafer Youssef s’affirme avec cet album dont la sortie est prévue pour le 16 septembre 2016 comme l’un des musiciens les plus innovateurs de la dernière décennie. 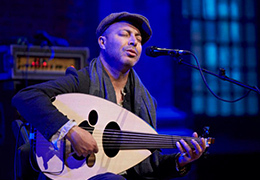 Weltmusik mit hohem Jazzanteil präsentiert Dhafer Youssef auf seinem neuen Album ,,Birds Requiem” (Sony/ Okeh 88883721842). 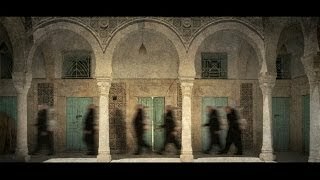 Der Tunesier schafft musikalische Stimmungen von herber Schönheit, die ihm als Grundlage und Mittler für seinen Sufi-Gesang und die exotischen Klänge seines Oud dienen. Youssef turnt dabei einen geschickten Spagat zwischen geographischen Ethnien und musikalischen Stilen. So lassen sich Traditionen seiner nordafrikanischen Heimat ausmachen und die persönlichen Erfahrungen in seinem jetzigen Wohnort Paris. Hinzu kommen Gäste wie die beiden Norweger Nils Petter Molvaer und Eivind Aarset, die seiner Musik etwas intellektuell Kühnes geben. Wohltuend der Wechsel von zart impressionistic gehaltenen Kompositionen und aufschäumenden, mit Leidenschaft vorgetragenen Klangkaskaden. Wie Schwalben in der luft Dhafer Youssef ist auf eigensinnige Art international. Seine Musik ist Bekenntnis und Manifest zugleich, Selbsterforschung und Offensive im Spannungsfeld der Kulturen. “Incarnation (Bird’s Requiem)” (Sony) spielt mit ideen,Haltungen, Emotionen-eine wild meditative Mischung aus großen Klangräumen und schüchtern Motiven. Tunesien ist ein Spiegel, den Dhafer Youssef sich vorhält. Es ist Herausforderung, aber auch ein Refugium, von wo aus er seine eigene Identität durchdenkt. Die wiederum fängt grundlegend mit dem Instrument an, das für die anspruchsvolle Musik des nordafrikanischen Kulturraums steht: “Wenn ich in der Frühe aufstehe, singe ich nicht, sondern spiele erst einmal Oud. Sie ist mein Instrument, meine erste Türe zur Musik. Wenn ich die Oud am Morgen nicht berühre, habe ich das Gefühl, dass ich kein Musiker bin. Sie ist mein Kompagnon, sie soll zufrieden sein, genau wie ich selbst. Auf der anderen Seite habe ich das Gefühl, dass ich mit der Zeit mit meinem Gesang mehr machen kann als früher. Ich habe erst wenig davon benützt und bin auf dem Weg zu meiner eigenen Stimme. Das ist auch eine Frage des Alters. Es wird einem eher klar, was schön ist und was weniger. Und es ist auch ein Abenteuer. 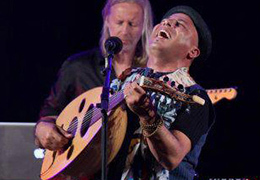 « So wie vieles für Dhafer Youssef, der im Laufe der Wanderjahre von Österreich über Deutschland, Frankreich, Italien in Skandinavien landete und überall Musiker kennenlernte, die seine Suche nach Klang im Wechselspiel mit der Tradition befeuerten. Einige davon bilden seitdem sein aktuelles quintet: der Gitarrist und Soundscape-Spezialist Eivind Aarset, der Pianist Kristjan Randalu, der Bassist Phil Donkin und Schlagzeuger Chander Sardjoe. 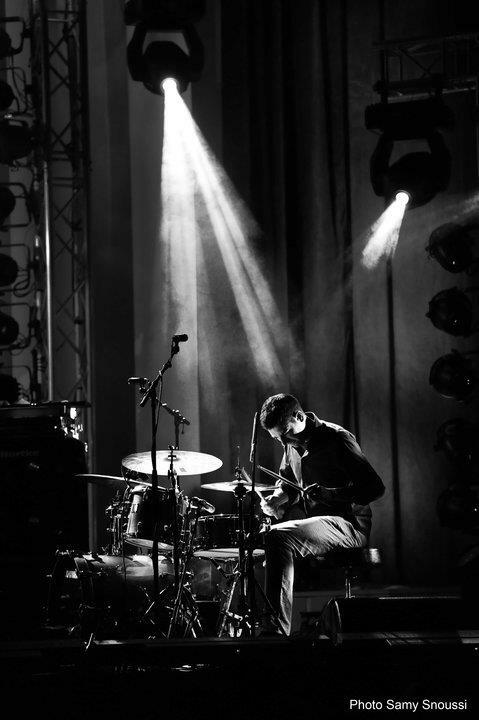 Andere sind Gäste und Wunschpartner wie der Trompeter Nils Petter Molvaer, der Klarinettist Hüsnü şenlendirici und Aytaç Dogan an der Kanun. 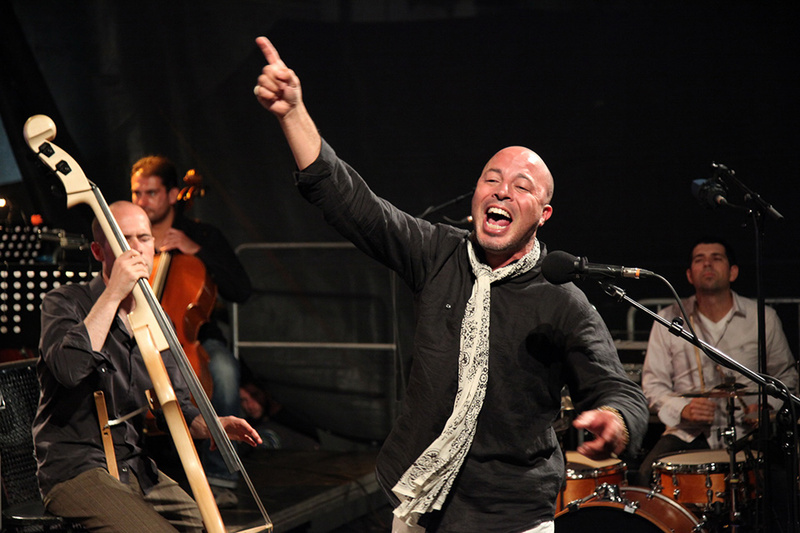 Mit diesem Team hat Dhafer Youssef in Göteborg “Incarnation (Birds Requiem)” auf genommen, ein Programm, das ursprünglich für die Schlossfestspiele Ludwigsburg 2011 entstand und angesichts eines magischen Konzerts unbedingt auf Platte festgehalten werden musste. 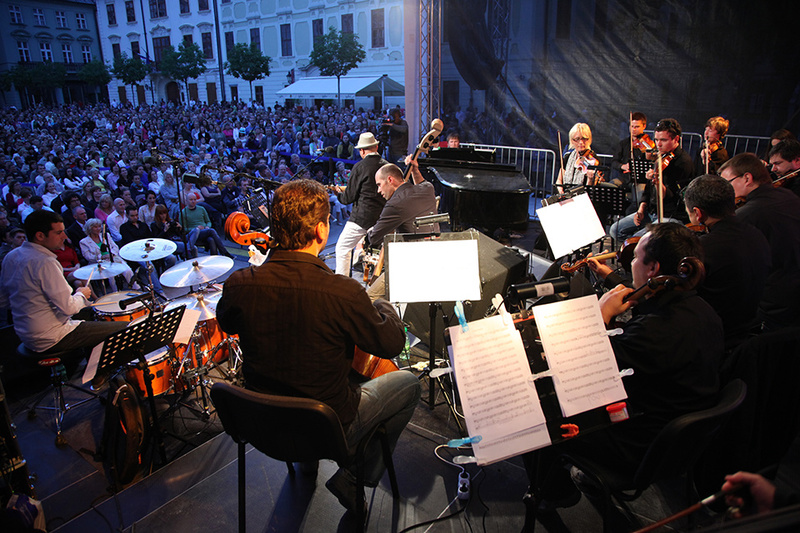 Es ist intuitive, weitschweifende Musik, die ihren Ursprung in orientalischen Erzählstrukturen hat, stellenweise deren Aufbau übernimmt, ihn aber mit Songstrukturen und Improvisationsmustern aus der Jazz- und Rockwelt modifiziert. Herbe Wucht steht neben feinen Ornamenten, als Kontrast und zugleich als Komplement zu Youssefs Ideen. Manche Stellen wirken langatmig, einem eigenen Tempo geschuldet, andere anrührend und getragen von den Emotionen der Gemeinsamkeit, die den Bandleader im Besonderen mit der Klarinette verbindet: “Immer wieder, wenn ich mit Hüsnü spiele, habe ich das Gefühl, dass ich zur Klarinette werde. Seine Lippen und meine Stimmbänder sind wie zwei Schwalben, die sich in der Luft umkreisen, manchmal harmonisch, manchmal angriffslustig.  Es war für mich sehr wichtig, dieses Zusammenspiel musikalisch einzufangen, und da paste das Bild de Vögel. Eine sehr persönliche Komponente war außerdem, dass meine Mutter zu der Zeit starb, als diese CD entstand. Ich hatte das Gefühl, dass ich ihre seele wie einen Vogel noch sehen konnte, obwohl sie schon gestorben war. Wirklich erklären kann ich das nicht, aber es wurde auch ein wichtiger Teil der Musik. “Man hört es.,, Incarnation” ist Musik mit Wut, Frohsinn, Unbekümmertheit. 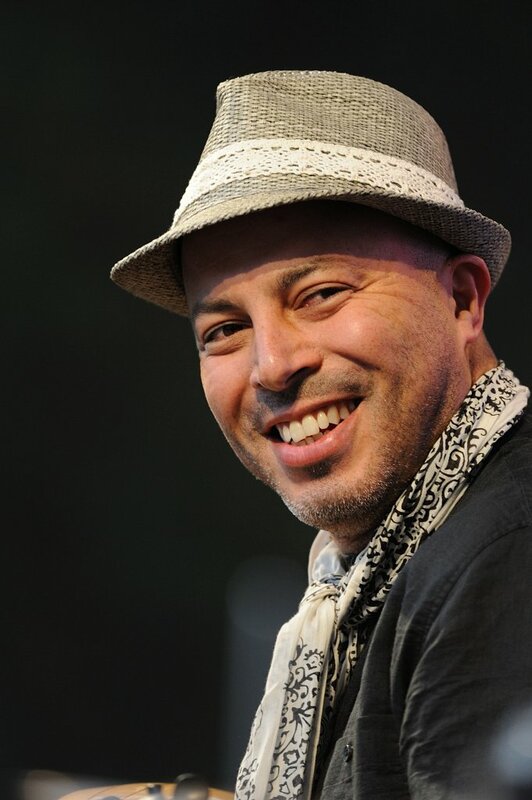 Es ist ein Album, das sosehr Dhafer Youssef verkörpert wie nur irgend möglich. The young Dhafer did what was expected of him and sang, having learnt at the traditional Koran school, but at the same time, he was hearing music on the radio - the only source of entertainment in this small town. "It was just music. 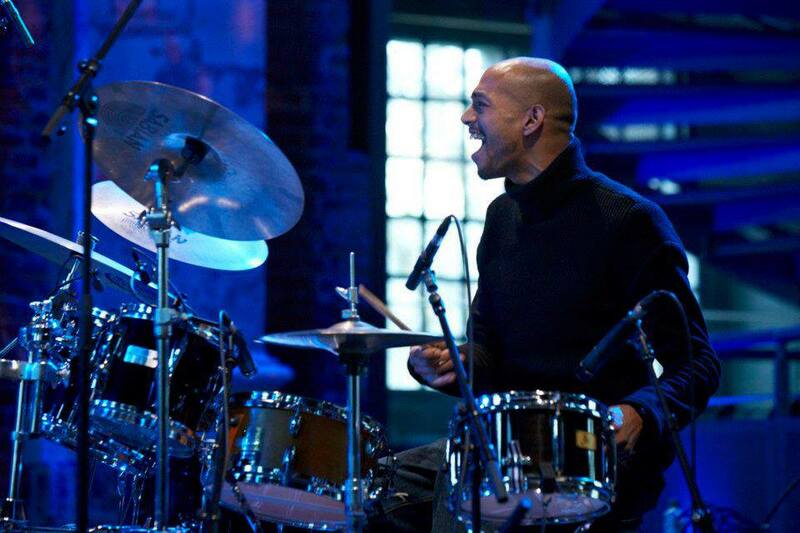 That's all I knew" says Dhafer "I didn't know what was classical what was jazz and so on. 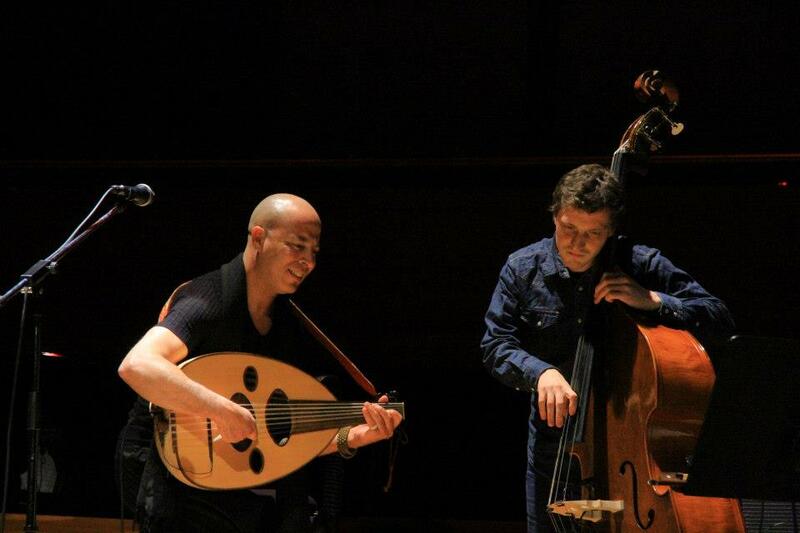 Just music..." And so, on his homemade oud, Dhafer taught himself to play by ear. One day a friend came back from his travels with an electric guitar and a small toy one for his young nephew. 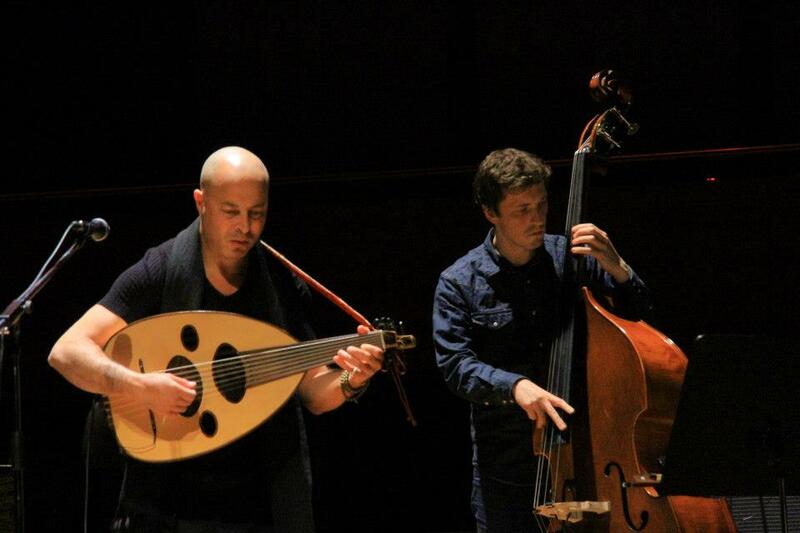 Dhafer borrowed the toy for a week, at the same time secretly yearning to get his hands on the proper instrument. Eventually his friend began to lend it to him for a few days at a time: "days when I didn't sleep, the time was too precious. I just played." As he began to earn money by singing at weddings, he saved enough to buy his first 'real' oud for the equivalent of 100 Euros. This was frowned on by friends and family. "God's given you a voice, you've got to sing." 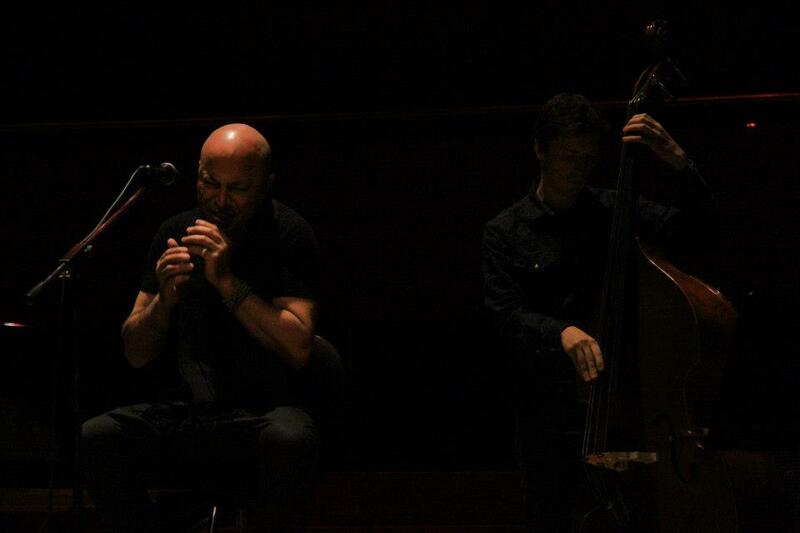 But Dhafer had fallen in love with the sound of the instrument. It was the sound of his roots, the country where he was born. "If I'd been born in Africa I'd have been a drummer. In New York- a sax player. 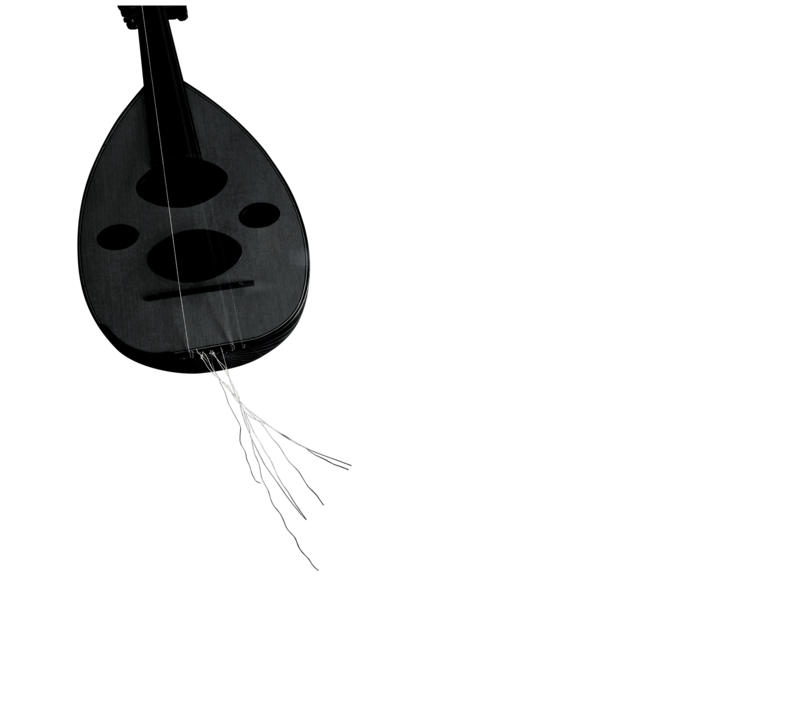 But I was born in Tunisia -I play the oud. 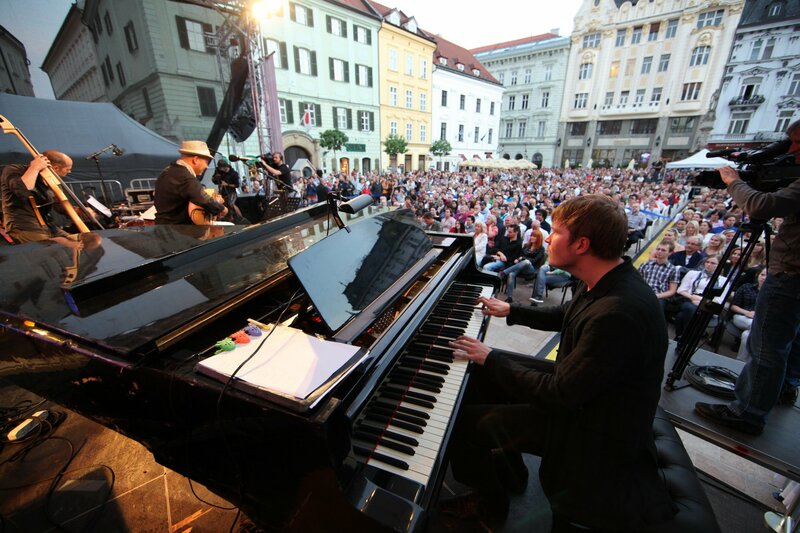 If I'd been brought up near a piano maybe I'd have played that, but actually I didn't even see my first piano until I went to Vienna when I was 19." Vienna lured him with the promise of the opportunity to study music. "I did anything I could to earn money. I washed dishes, cleaned windows, worked as an Italian waiter even though I wasn't Italian. I did anything I could just to keep the music going. But I still couldn't read music. I went to listen to lots of music: jazz, classical, anything. And I met a viola player Tony Burger who patiently helped me to write my music down, and we would just play together for hours. Then I met the tabla player Jatinder Thakur who really got me into Indian music. This was a BIG discovery. I fell in love with the sound. It seemed so near to my soul, and I played with him every day. He was at the heart of the first quartet I played with." 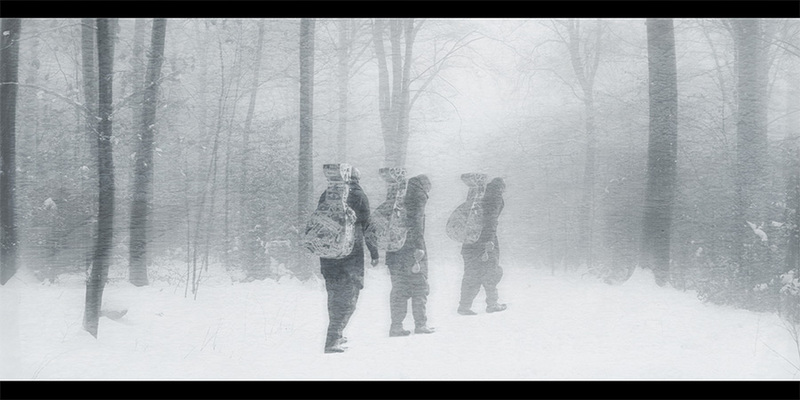 "In Vienna, I was still working to survive. But, I have to say, it was the most beautiful time of my life. It was a dream coming true: I was doing my own music, bringing alive the colours in my soul, playing a lot of theater music with people like accordionist Otto Lechner." "Then along came an amazing opportunity. 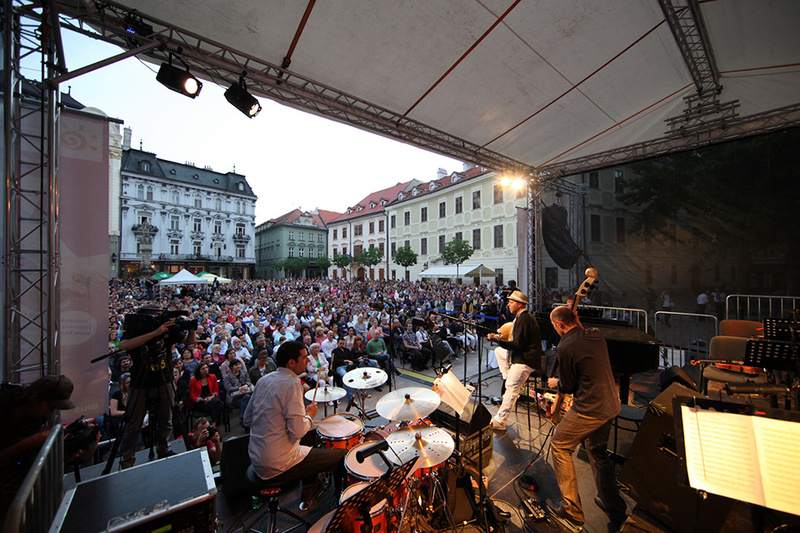 The Jazz club Porgy and Bess in Vienna would give a musician carte blanche to do what they liked, one night a month for the next twelve months. A new project every month. I could invite anyone I wanted to play with me so I just thought: 'why not?' and asked so many people I admired from all over the world: Iva Bittova, Peter Herbert, Renaud Garcia Fons and Christian Muthspiel for example." "It was a huge success and I got to do in nine months what might have taken ten years. I was doing something completely different each month and at every gig, people would come up and ask about the music. Sometimes, things went so well with the musicians that one night at the Porgy and Bess wasn't enough and we'd go into the studio to record. That's how my first album, Malak came about." "Well, after that, I thought I would go back to Africa in search of my roots, but after a while, I felt that Europe was where my home was. My creativity is in Europe and wherever that is, there is my home. 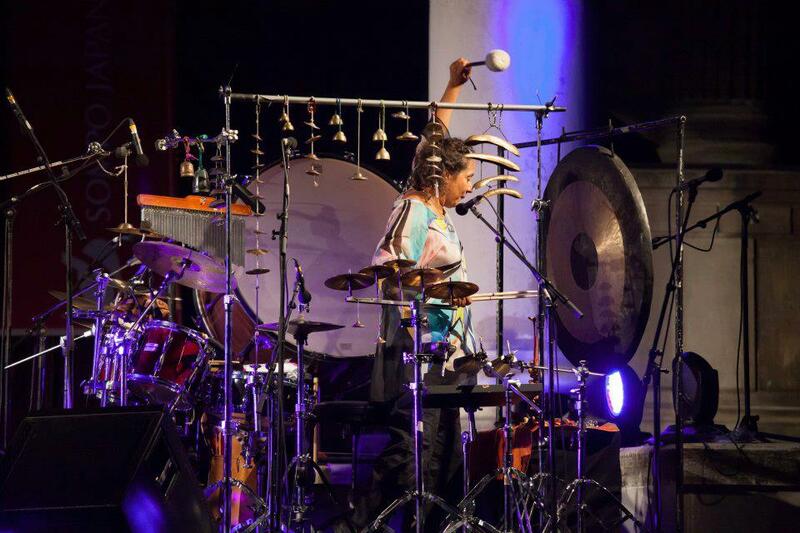 Enja wanted another recording from me and I went to New York for a while and recordedElectric Sufi with a group which included Dieter Ilg, Markus Stockhausen and Doug Wimbish." "But then came September 11th and I just thought in this troubled world I should return to Paris." 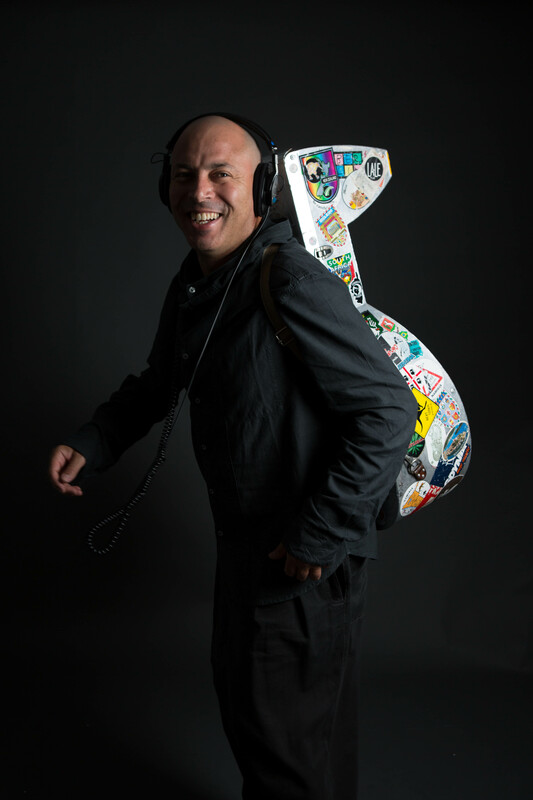 "I began to have more and more contact with Norway and Nils Petter Molvaer invited me to play with him and the singer Anneli Drecker." 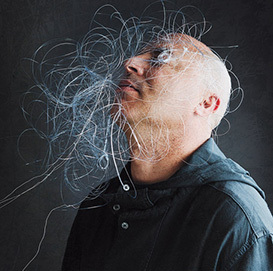 This lead eventually to his third album, Digital Prophecy. 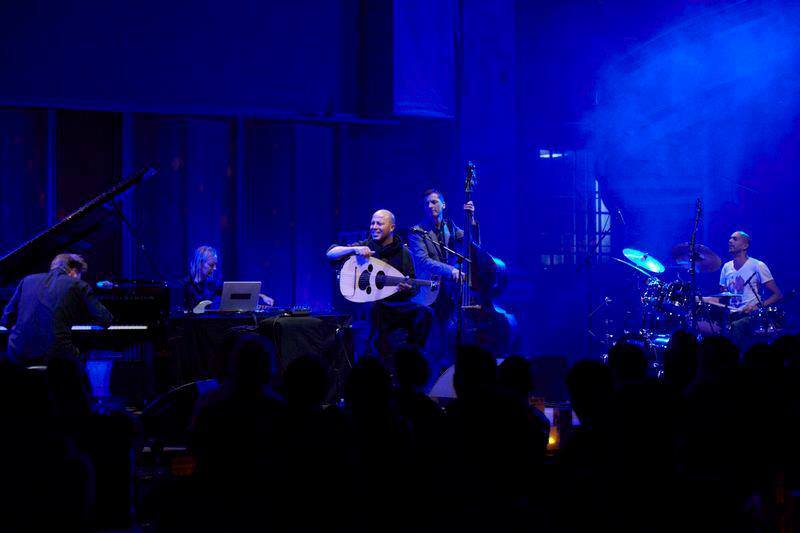 Here, Dhafer's profoundly spiritual singing and playing become embedded in the Scandinavian, existentialist world of Norwegian music, embodied in the playing of Eivind Aarset on guitar, drummer Rune Arnesen, Bugge Wesseltoft on keyboards and Dieter Ilg on bass, along with the sampling of Jan Bang. 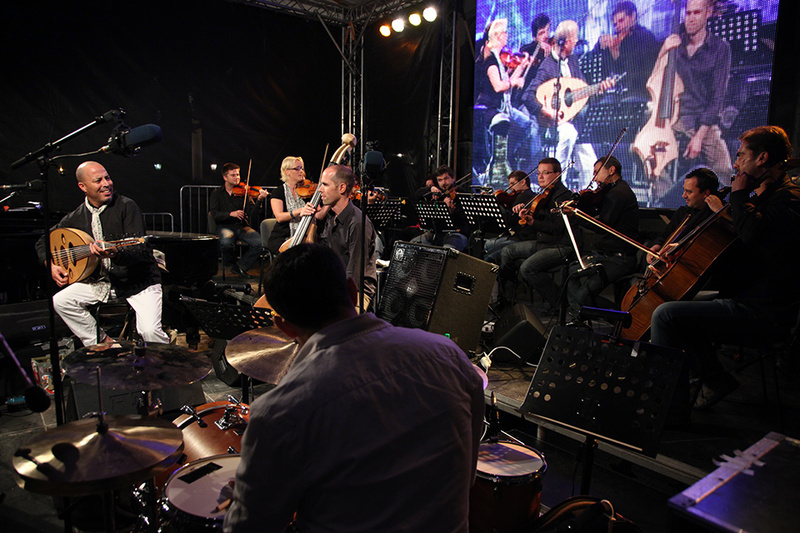 "I just love playing with musicians from the North. They are more African than some Africans and they are an inspiration to me." "I am the only one who doesn't speak Norwegian!" 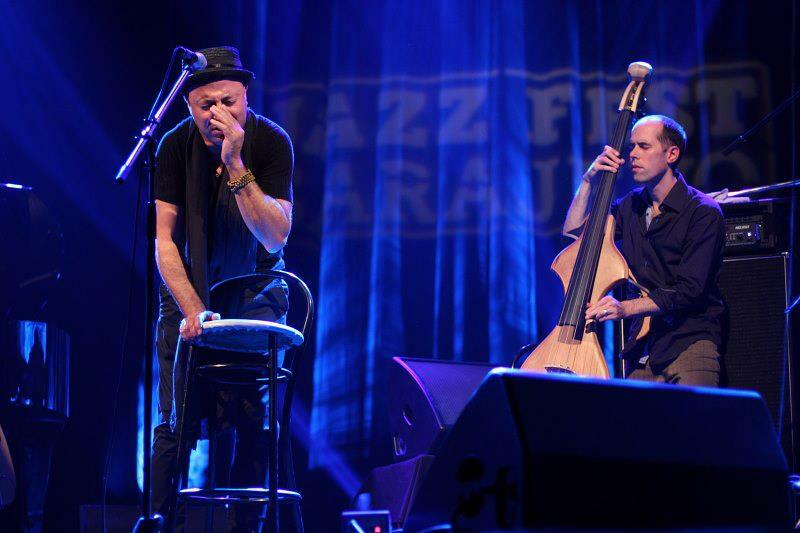 says Dhafer, "but our gigs together are not about what happens for an hour on stage. These are simply great human beings, and how we are as musicians comes as much from the time we spend hanging around: waiting at airports, traveling together, being on the road, in a bus, sharing good food." 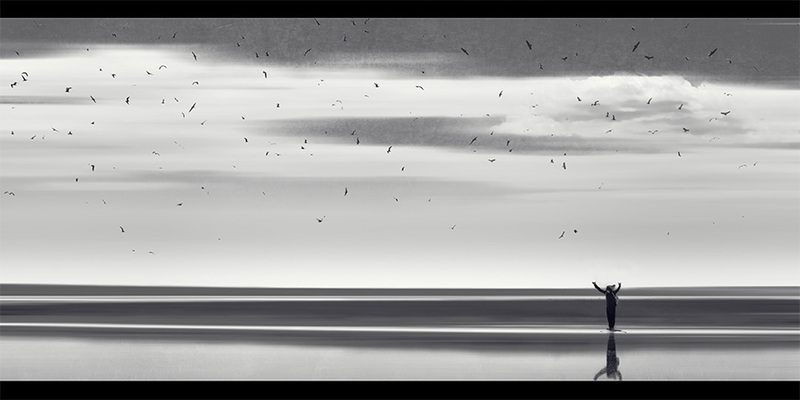 POUR BIRDS REQUIEM, LE TUNISIEN A DONNE-RENDEZ VOUS A SES AMIS SCANDINAVES AFIN DE MIEUX CHANTER SON DEUIL. L’incantation inscrite dans Birds Requiem, où il est question de vols et de disparitions, est un voyage vers l’intérieur de soi, à la différence d’Abu Nawas Rhapsody, disque plutôt expressif et exubérant. 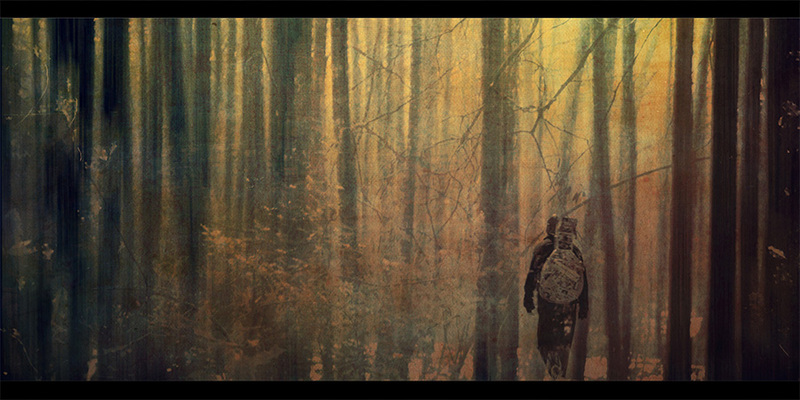 L’album est comme un film, articulé autour d’une suite de quatre morceaux et un leitmotiv, les oiseaux : « Birds Canticum », « Fuga Hirundinum », « Archaic Feathers » et « Whirling Birds Ceremony ». 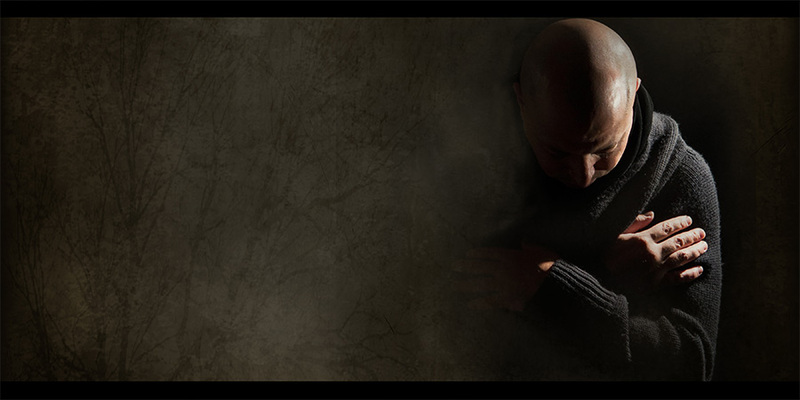 « Chaque disque est un versant, une incarnation de mon âme, explique Dhafer Youssef. Cette « étape » avait atteint son climax avec son précédent quartette – Tigran, Mark Giuliana et Chris Jennings. Une alchimie unique qui transmettait de la joie comme jamais auparavant chez Youssef. « Abu Nawas était un moment magique, aux côtés de musiciens merveilleux. 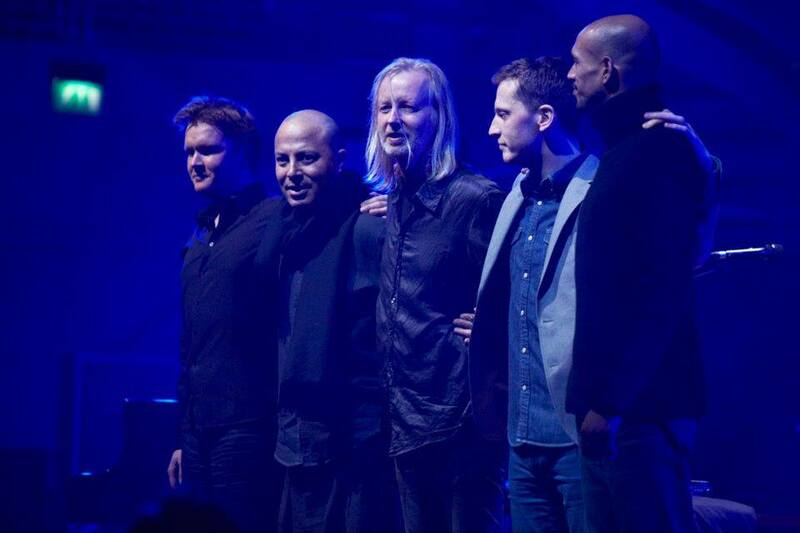 Pour son projet Digital Prophecy, Dhafer Youssef avait eu l’occasion de tourner avec Aarset, Rune Arnesen, Jan Bang et Arve Henriksen, de baigner dans leur atmosphère et de les découvrir en profondeur. un émigré maghrébin, où il est devenu un habitué du club Porgy and Bess. Présent dans la ville autrichienne au bon moment, il y rencontra les bonnes personnes : Wolfgang Puschnig, Linda Sharrock, les frères Muthspiel. Le 30 novembre 2013 par Anne Berthod I Télérama. 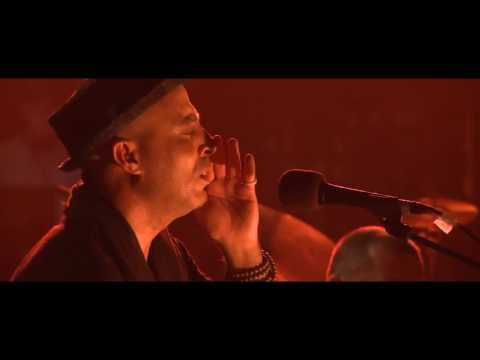 MUSIQUE DU MONDE | Nourri de soufisme et d'électro-jazz, l'oudiste tunisien Dhafer Youssef signe un album à son image : libre et inspiré. Il est en concert cette semaine à Paris. En effet, il n'y a rien de funèbre dans le huitième album du vocaliste et oudiste tunisien. Il s'agit d'un requiem à la fois grave et lumineux, introspectif et aérien. Nulle lamentation non plus dans les mélismes lancinants de sa voix si singulière, dont les aigus stupéfiants évoquent une sorte de gémissement céleste. Sur le morceau en question, il chante, ou plutôt il étire, de façon assez expérimentale, les vers bachiques d'Abu Nawas, l'un de ses auteurs de prédilection. 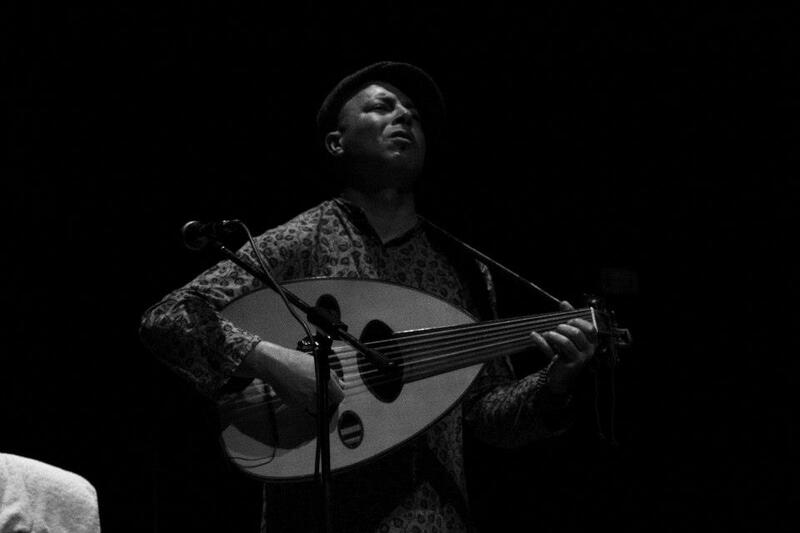 "Mon rapport à la religion est resté musical"
Musicien autodidacte, Dhafer Youssef a trouvé ses marques en Europe, à la croisée du lyrisme oriental et du jazz contemporain. 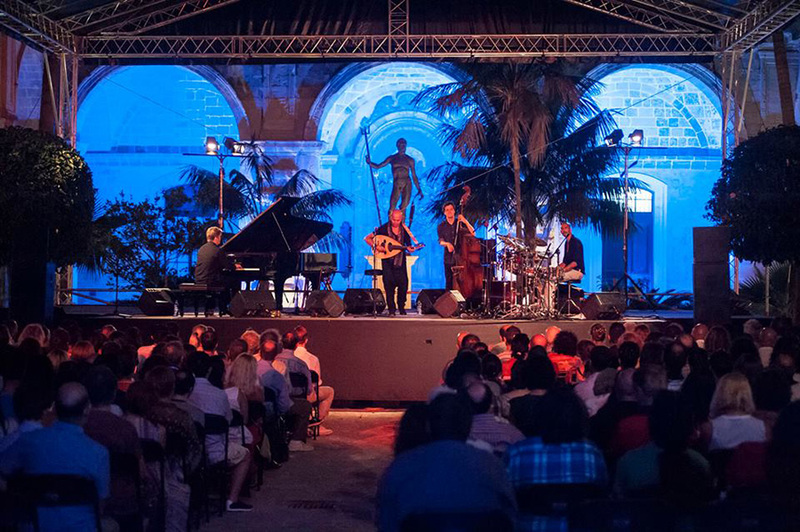 Au-delà de Vienne et de Paris, villes de rencontres (les pianistes Omar Sosa et Tigran Hamasyan, le guitariste Nguyen Lê, le trompettiste Paolo Fresu...), il a entretenu des complicités fécondes au sein de la scène norvégienne, notamment avec le trompettiste Nils Petter Molvaer, pionnier du nu jazz. « Je partage avec eux cette histoire divine qu'est l'improvisation. » Renouant aujourd'hui avec ses amours scandinaves, il s'éloigne de l'électro-jazz pour aller vers l'épure, parce qu'il « faut apprendre à jouer moins pour raconter plus ». 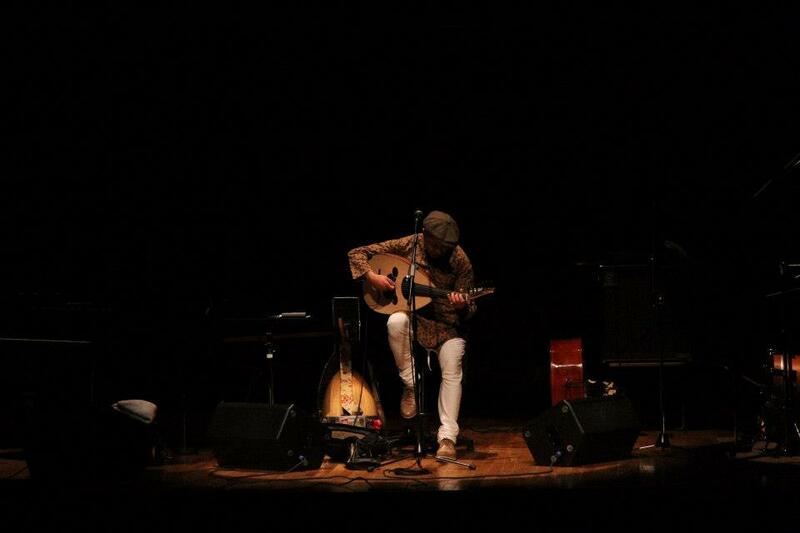 Il y a trois ans, ce musicien globe-trotteur est retourné s'installer en Tunisie avec sa compagne, « pour vivre un changement historique ». Aux journalistes qui lui ont reproché là-bas ses textes blasphématoires, il répond qu'il ne fait pas de politique : «Un artiste qui ne dit pas ce qu'il pense est un idiot. Mais ma révolution, c'est ma musique. Il faut rendre la religion à Dieu, la patrie au peuple, et la musique au musicien. » La sienne n'en est pas moins mystique. En live, improvisée « à 40 % », elle exprime une émotion fervente. 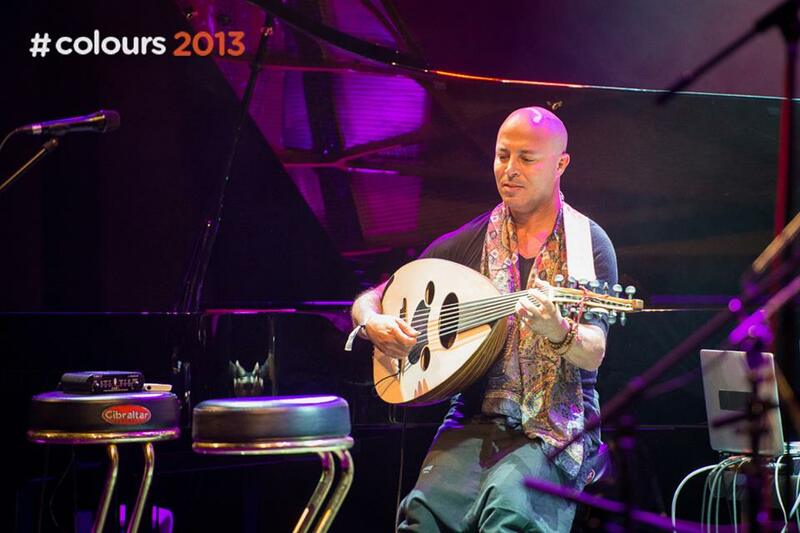 Dhafer Youssef, en concert le 29 novembre à Paris. Dix ans après Digital Prophecy, le vocaliste et oudiste tunisien retrouve le trompettiste norvégien Nils Petter Molvær, pionnier du « nu jazz », et renoue avec ses amours scandinaves pour un disque qui oscille, encore, entre profane et sacré. Moins électro que par le passé, il y prolonge I ‘esthétique jazz du précédent Abu Nawas Rhapsody. 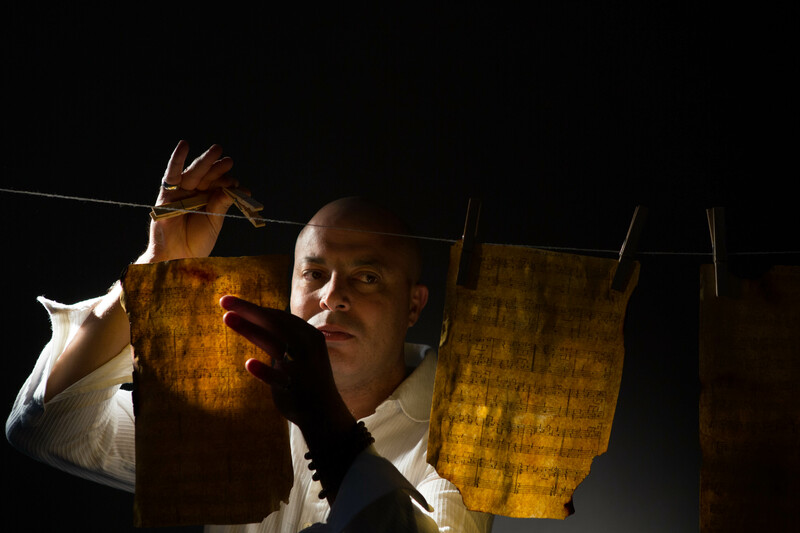 Mais s'il module toujours les vers mystiques du lettré soufi, ce n'est pas pour en exalter l‘ivresse bachique: cette fois; Dhafer Youssef tend vers l'épure. Là où le pianiste Tigran Hamasyan et le contrebassiste Chris Jennings n'étaient que tourbillons, son équipe norvégienne, elle, déploie des aurores boréales planantes, dépouillées, sur des tempi en suspension. Tout n'est qu'apesanteur: l‘oud, introspectif et grave, le piano, évanescent, la trompette, qui joue la pause et installe des atmosphères de vieux films, jusqu'au guitariste, très rock sur deux titres, qui distille ailleurs des effets électro ascétiques. La clarinette, elle, se fait l’écho stupéfiant de la voix mutante de Dhafer Youssef: de ce timbre nasal quasi surnaturel, il repousse encore les limites, tient la note lors de mélismes aigus, lancinants, qui touchent au divin. Une musique d'ambiance qui marie ferveur et sérénité, minimalisme et profondeur. 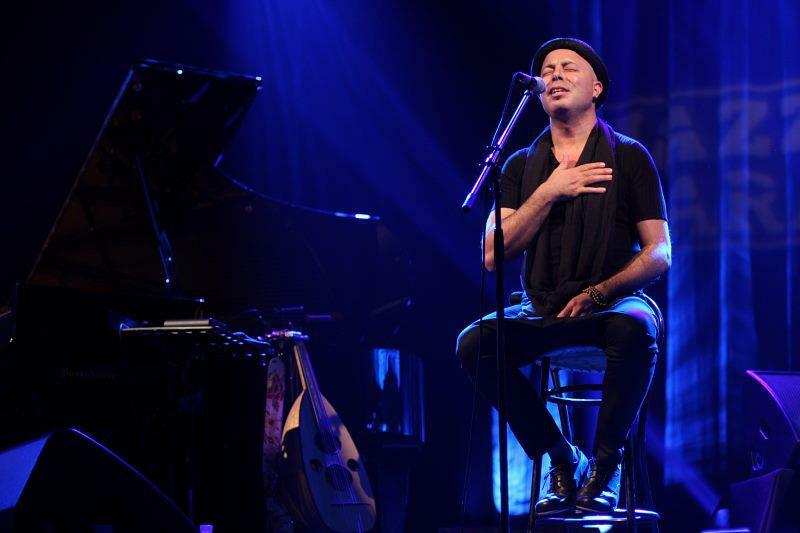 “Le piano prend le oud dans ses bras sur cet album… » En une phrase un brin énigmatique, Dhafer Youssef résume l’impression qui se dégage à l’écoute de « Abu Nawas Rhapsody ». L’entente entre Dhafer et le très prometteur pianiste Tigran Hamasyan saute aux oreilles, notamment sur les trois duos de l’album. « Ce sont les seules parties que je n’avais pas composées moi-même avant l’enregistrement », concède l’oudiste. 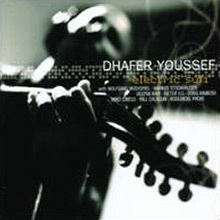 Dhafer Youssef. 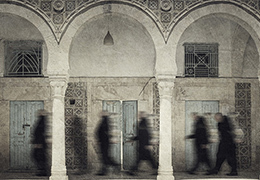 « Abu Nawas Rhapsody » (Universal). 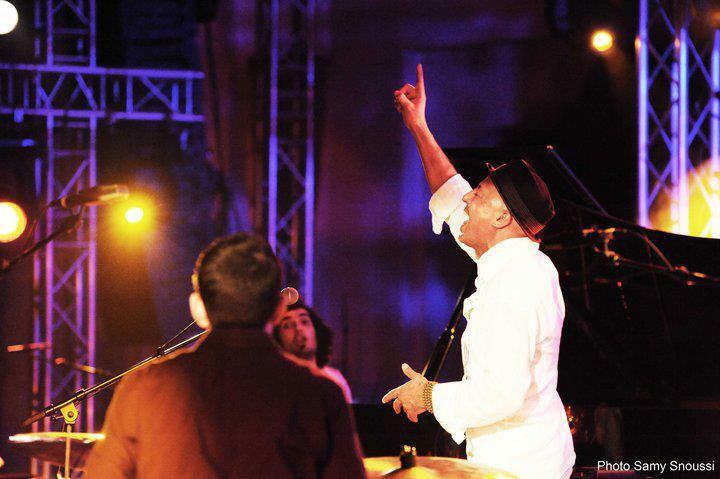 Avec Abu Nawas Rhapsody, le chanteur-oudiste tunisien Dhafer Youssef s’appuie sur un trio jazz piano-basse-batterie pour sublimer les antagonismes sacré-profane. Un art audacieux qui transcende les frontières. Une provocation profane dans un monde religieux, qui contenait en elle tout le sacré, tout le divin, quête de sens. 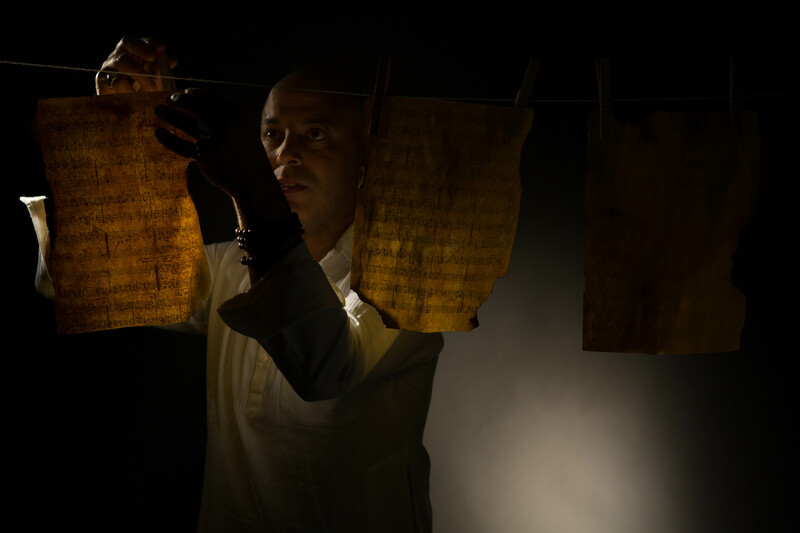 Dans cette rhapsodie, succession décousue des expériences fortes du poète, Dhafer ne se saurait pourtant trop s’appuyer sur la beauté littéraire du verbe, le musicien fait sa pâte, prétexte à vocaliser à l’infini, à toucher le corps plus que l’esprit, matières sonores, abstractions. Et puis, il y a cet autre poète soufi, Ibn al Farid (XIIème siècle, Egypte), auteur de vers somptueux sur la relation entre extase divine et ivresse du vin, qui lui donne l’inspiration de sa Wine Ode Suite, œuvre en trois actes d’improvisations méditatives avec le pianiste prodige Tigran Hamasyan. L’antagonisme profane-sacré, une fois encore, constitue le fil conducteur de la musique de Dhafer, ancien muezzin : la voix, comme don de soi, sacrée, mais refus forcené de toute vérité dogmatique. Pour mener à bien cette aventure spirituelle, Dhafer relègue un temps ses escapades électro, pour revenir à la sacro-sainte formule piano-basse-batterie. 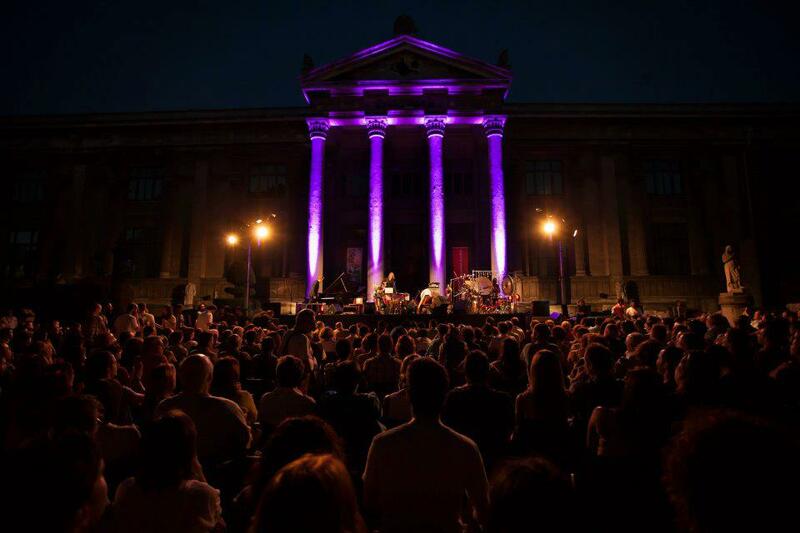 Entouré de jeunes musiciens virtuoses (Mark Giuliana, Chris Jennings, Tigran Hamasyan), libres de toute entrave et bouffeurs de sons tous azimuts, Dhafer fait swinguer le sacré, ouvre les portes de la poésie, rénove la langue jazz qu’il affectionne tant ; peinture en réalisation, musiciens en train de vivre…Portant, malgré la liberté de style, le Tunisien nomade, éponge revendiquée de tous les pays traversés, expériences vécues, personnes côtoyées, ne saurait se retrancher derrière quatre lettres . 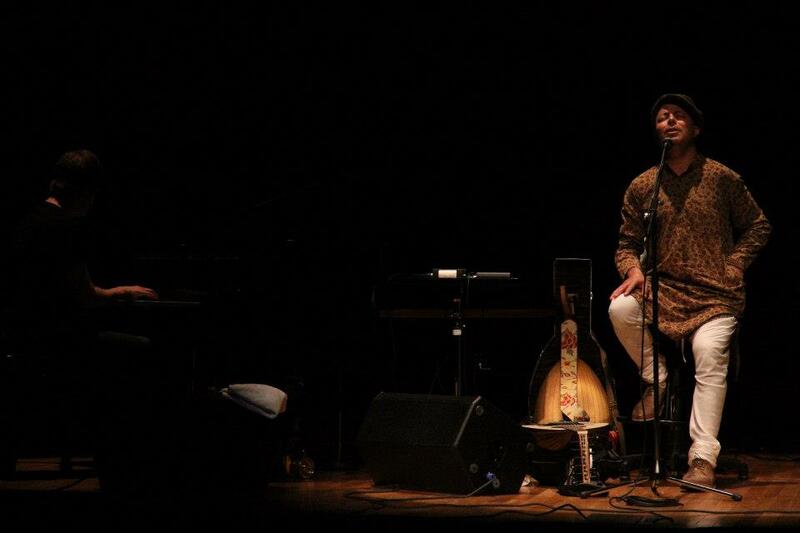 In this post 9/11 world, with its centrifugal drift to extremism, a new breed of North African and Middle Eastern musician has been in the vanguard of attempts to promote cultural tolerance and an alternative vision of Arabic and Islamic culture. 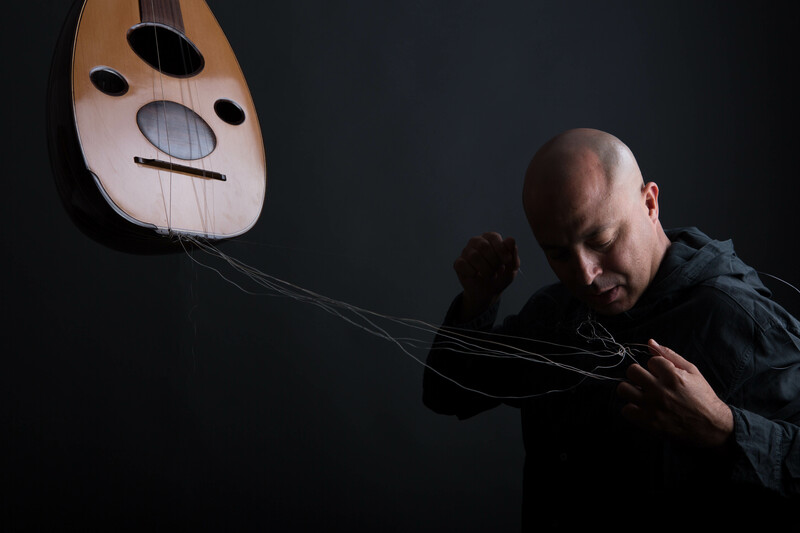 The Tunisian oud player Dhafer Youssef is living proof that, despite the bleetings of Salafist and Wahabi imams, music still holds pride of place in the Arab and North African heart. It has always been emblematic of that culture's willingness to tolerate and interact with other cultures. Youssef doesn't need to ride a camel or wear a djellaba in order to prove his point. 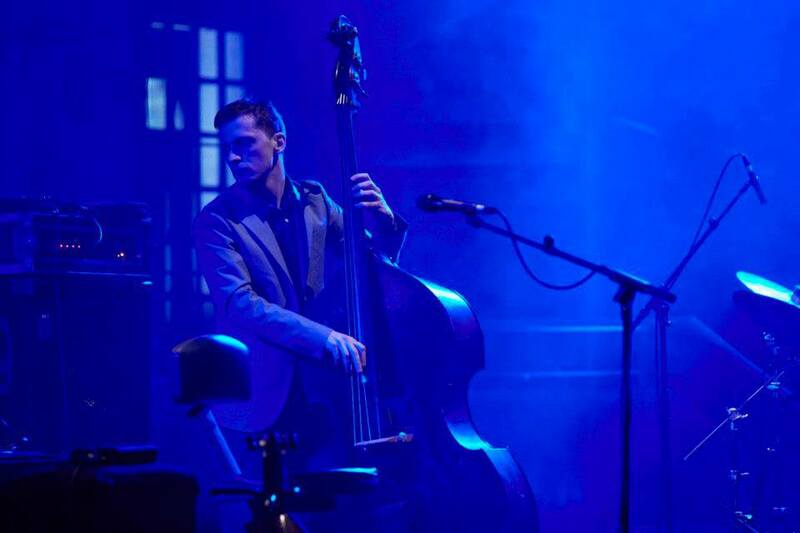 He only needs to be what he is: a vocalist and oud virtuoso of rare ability, a defiant cosmopolitan and a declared modernist who reserves the right to go where his muse takes him, and collaborate with anyone he might meet there. 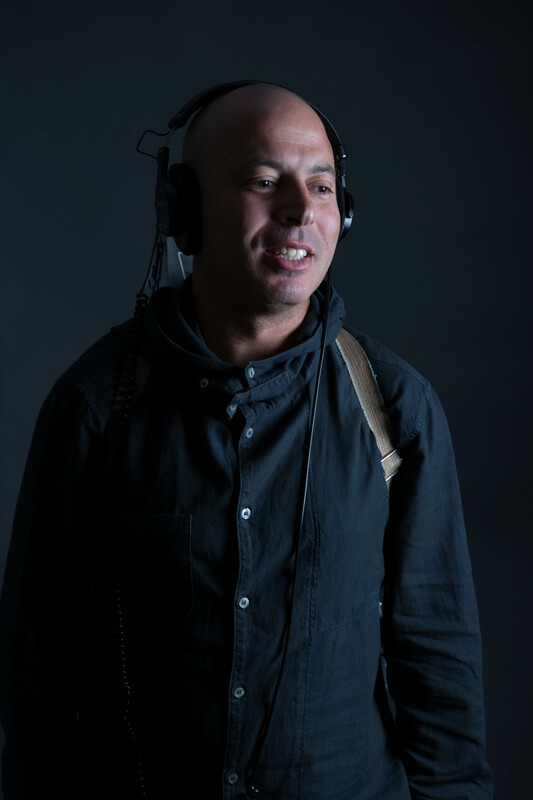 Growing up in the Tunisian port town of Teboulba , where he was born in 1967, Youssef absorbed the sounds he heard clandestinely on the radio, 'without a filter' as he himself recalls. 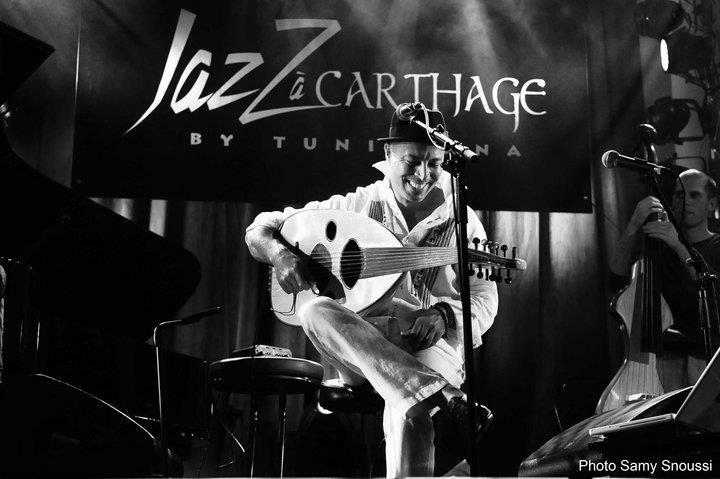 He had a special penchant for jazz and he soon realised that Tunisia would never give him the freedom to explore that particular path. So he left for Vienna, without a dinar to his name. His peripatetic life then took him to Barcelona, Berlin, New York, Dakar and back again to Vienna, meeting, playing and collaborating. 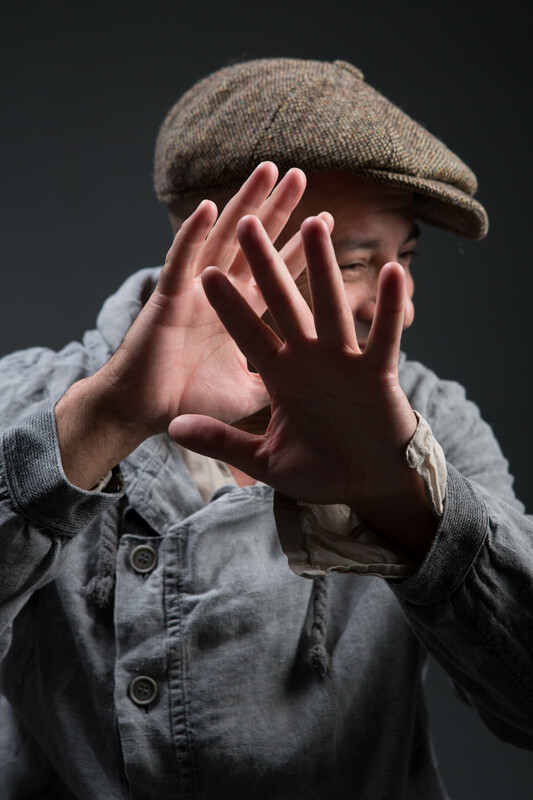 A debut release 'Malak' on the Enja label in 1999 sowed the seeds of an international reputation and Youssef moved to the Barbès district of Paris. He developed some perennial musical partnerships, notably with the Sardinian trumpeter Paolo Fresu and the Norwegian guitarist Eivind Aarset. 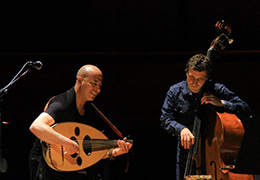 Youssef feels a special bond with Scandinavian musicians, which is fortunate, since Norway and Sweden are now widely regarded to have the most fascinating and dynamic avant-garde jazz scenes in the world. 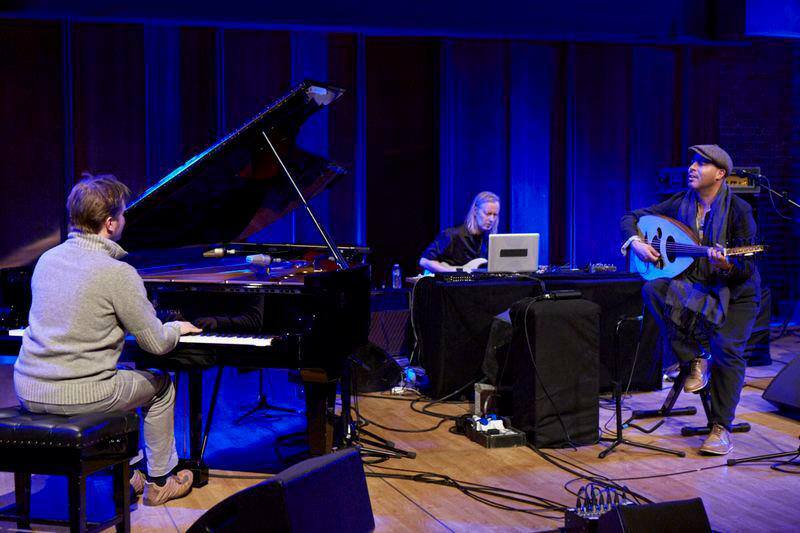 Youssef has also performed with Uri Caine, Jon Hassell, Markus Stockhausen, Nguyên Lê and the cuban pianist Omar Sosa, to name but a few. 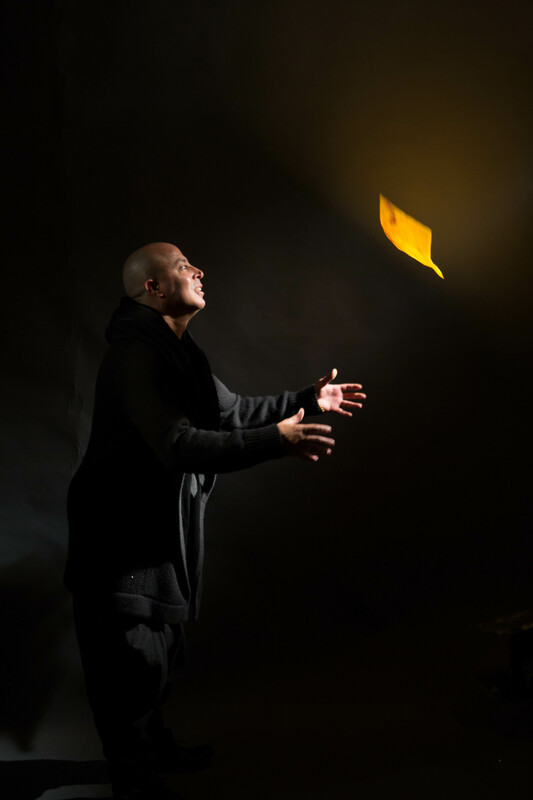 In 2001 recorded the 'Electric Sufi' CD with the ex-Sugar Hill Gang and Tackhead rhythm section of Will Calhoun and Doug Wimbush and followed it up recently with 'Digital Prophecy', another multi-layered, multi-faceted marvel. 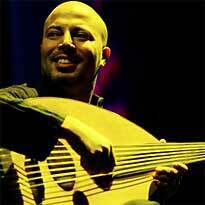 With walls, boundaries, barriers, labels and frontiers becoming ever more rigid and impregnable, Dhafer Youssef reminds us that any composer or musician of worth must be free to roam, with his body, his mind and his spirit, or music itself might end up being the biggest casualty.